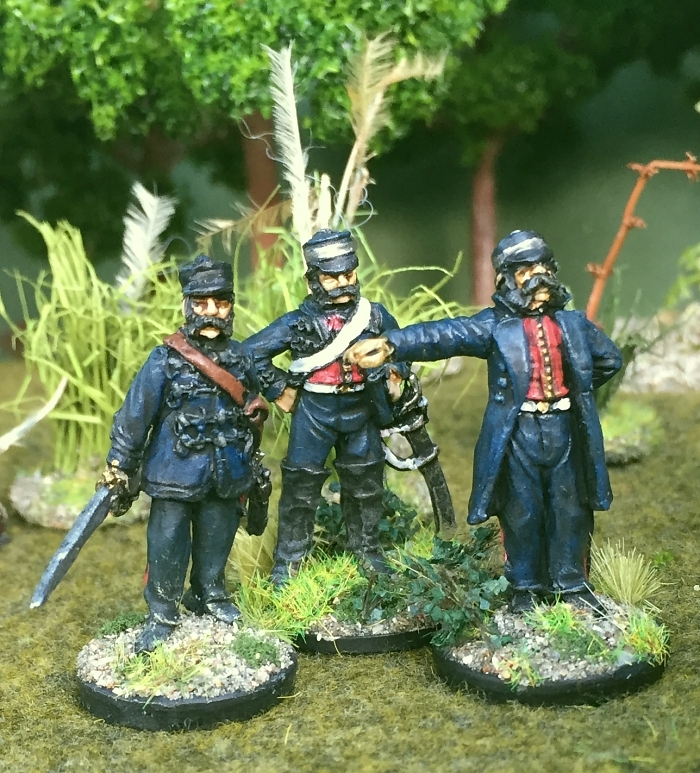 Today’s ‘On Parade’ posting features the beginnings of a Confederation of the Rhine wargaming army I had planned to build up during the early 2000s, but never really got too far with. 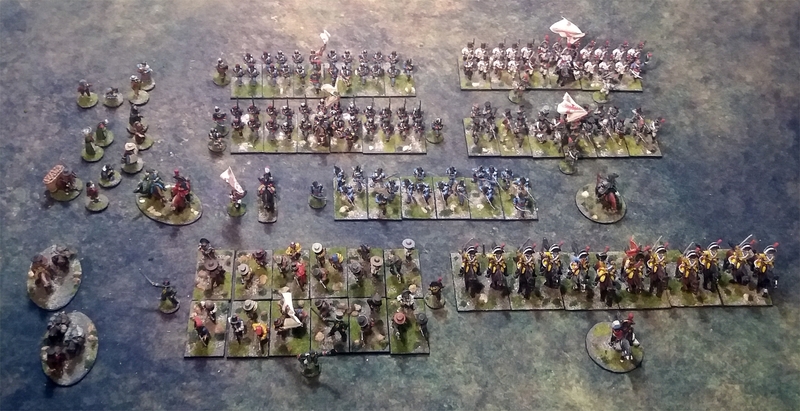 But despite having painted only two regiments, this ‘army’ can still fight alongside my Napoleonic French forces (subject of previous postings). The Confederation of the Rhine (or Rheinbund) was a coalition of German states created by Napoleon in 1806 as a buffer between France and its European enemies. Austria and Prussia were the only German states not included in the Confederation. The armies of these satellite states were allied to France, and took part in many of the famous campaigns of the Napoleonic Wars. Some of the bigger states such as Bavaria and Saxony had their own armies, while smaller duchies and principalities furnished contingents to make up the composite battalions. 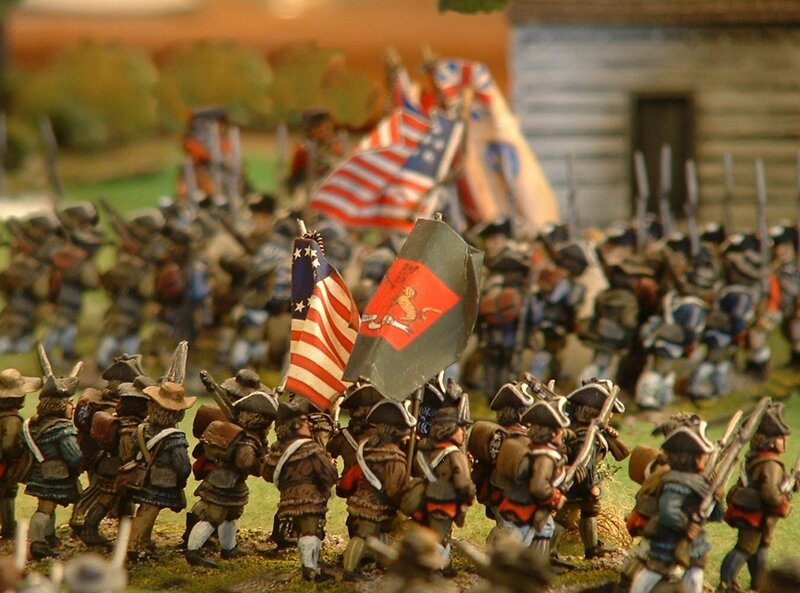 It was these latter forces that I had planned to portray in my miniature Confederation army. I feel sorry for the men of the 2nd Nassau Infantry Regiment. In 1813 these German allies of Napoleon defected to the British. One would have thought that defecting to the eventual winning side would have been a fortunate move. However, things didn’t turn out so well for the 2nd Nassau. 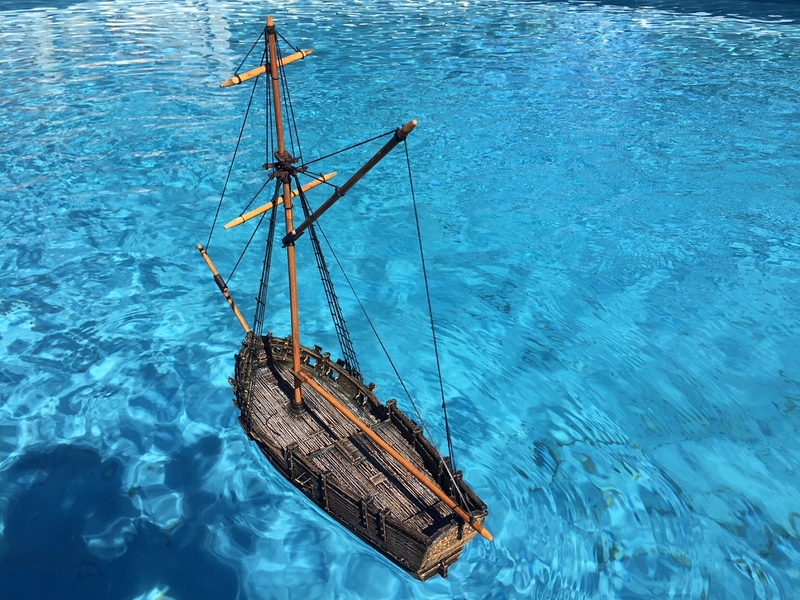 They were initially shipped to Britain, then in February 1814 they embarked to sail to the Netherlands. But disaster struck as two of their four transports ran onto a sandbank off the Dutch coast, and over 400 Nassauers perished in the wrecks. To survive so many years of harsh campaigning in Spain, including saving the day at Medellin in 1809, and then to die in a shipwreck, seems an incredible stroke of bad luck. When Front Rank advertised their Nassauers, I just had to have them for my army. 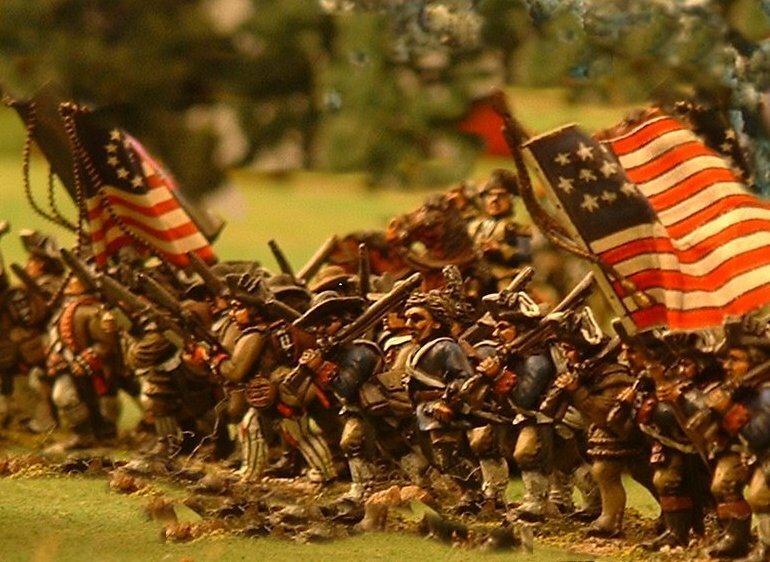 Besides the beauty of these figures, I also liked the fact that, with their defection, I could use them to fight on either the French or the Allied side in a conjectural battle. And their ornate uniforms would make a nice contrast with the rest of my army. The 2nd Nassau Infantry Regiment wore a smart green uniform with yellow trim (the Hungarian knots on their trousers are particularly nicely modelled by Front Rank). 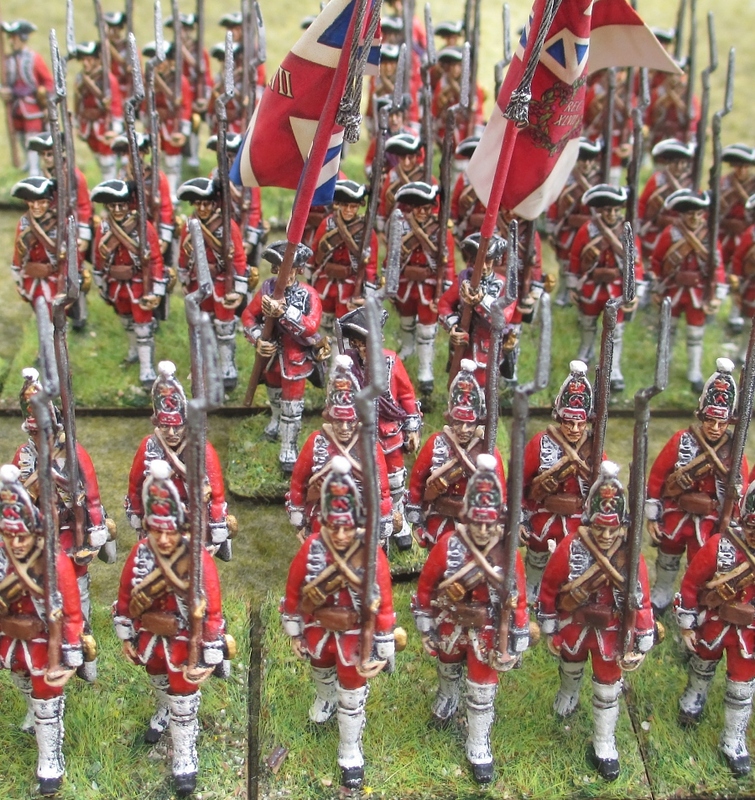 The grenadiers are resplendent in fur colpack hats with red plumes. One special feature of Nassau units is their yellowish leather equipment. In the Confederation of the Rhine, the former Bishopric of Würzburg became the Grand Duchy of Würzburg under Grand Duke Ferdinand of Tuscany. Würzburg supplied a regiment of infantry and a dragoon regiment to Napoleon’s war effort in Spain. 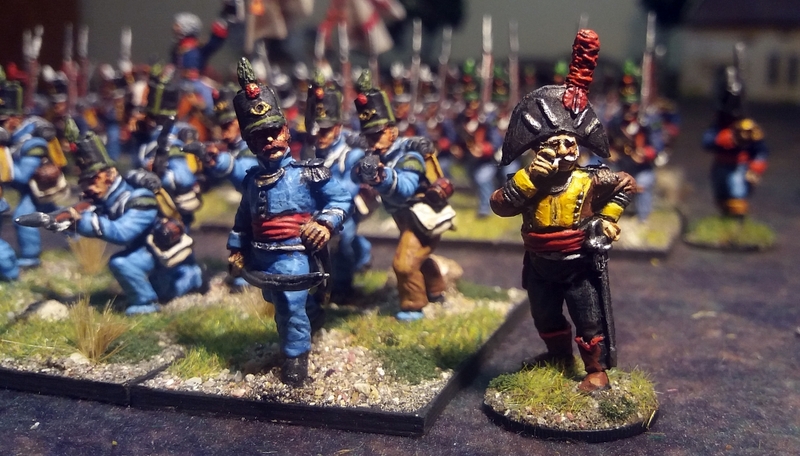 This unit of 28mm Front Rank miniatures started life as a French infantry battalion. But I decided that their advancing pose clashed with the attack march pose of all my other French infantry at that time, so I decided to repaint them as a Confederation of the Rhine battalion instead. 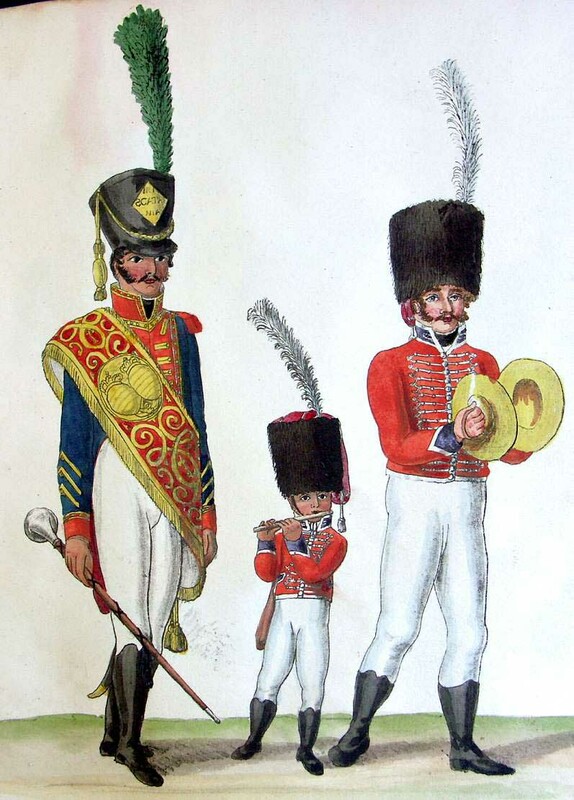 In the early part of the Peninsular War the Würzburgers wore helmets, but by 1812 they wore French shakos. 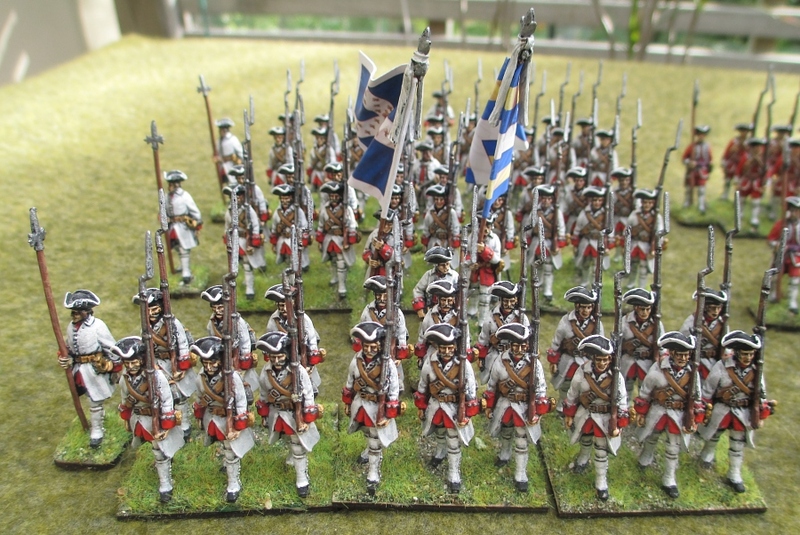 So all I had to do was repaint my French infantry with white coats faced with scarlet, and – hey presto! 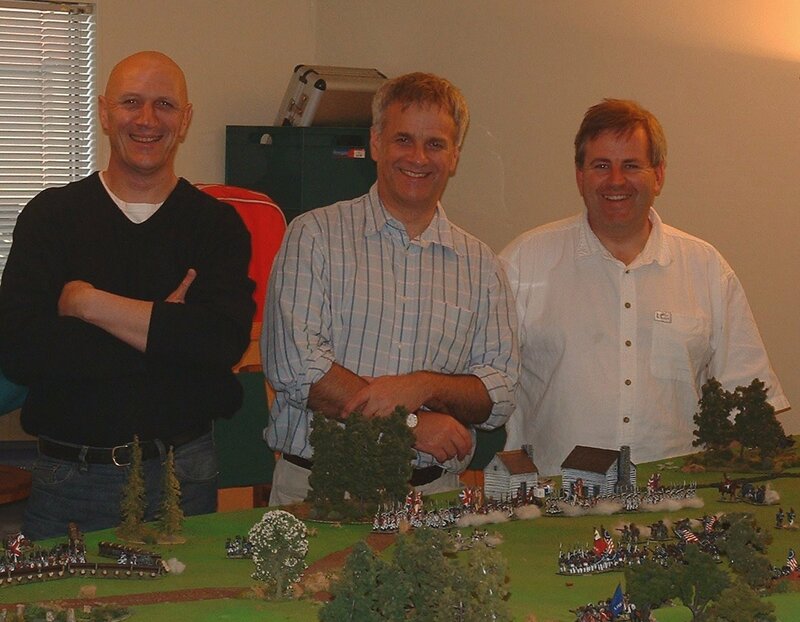 – a Confederation of the Rhine regiment. The drummer is an old Hotspur figure. His smaller dimensions make him look like a drummer boy against the larger Front Rank figures. The flag is from the Warflag and Napflags sites. 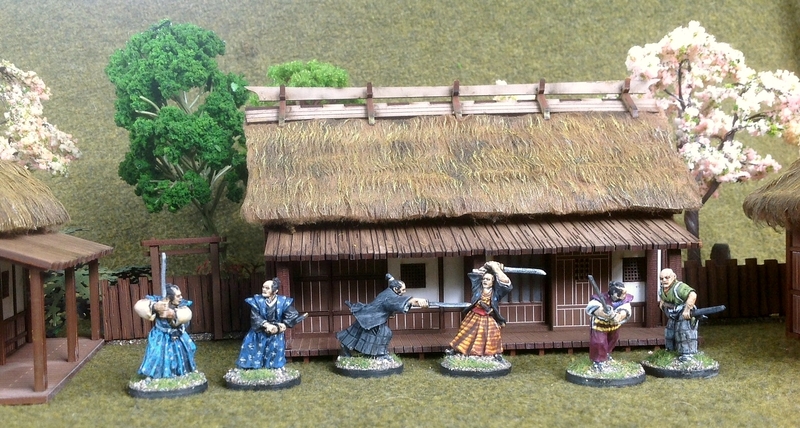 I’ve resized it to be about the correct size for my 28mm miniatures. 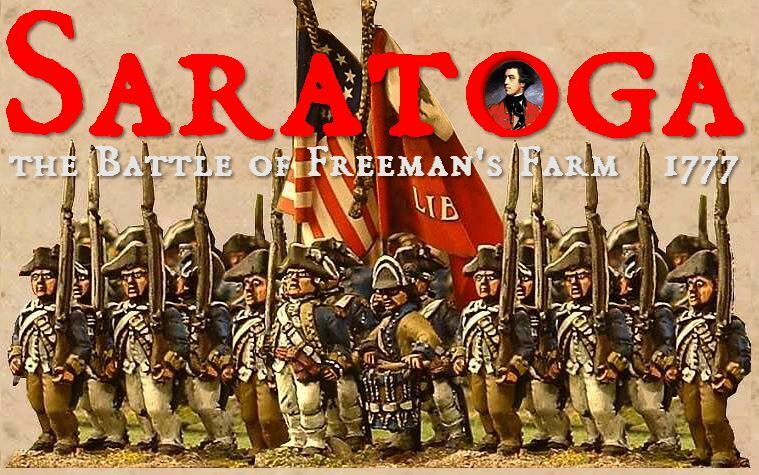 The next ‘On Parade’ posting will still be Napoleonic, but a little different this time. Keep checking! 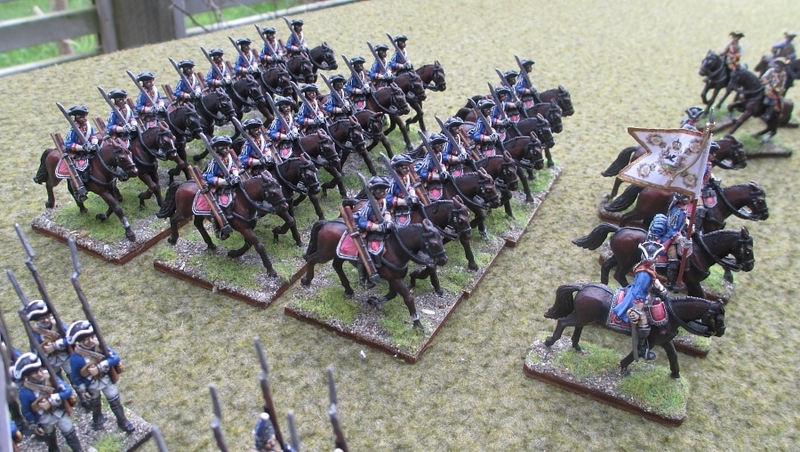 Following on from the inspection parade of my Napoleonic French infantry, it’s the cavalry’s turn to be reviewed. I painted most of these figures back in the early 2000s. You’ll see that some of them are painted in a simple block colours, because at that time I hadn’t yet learned how to use highlighting and shading! As usual in my postings, you can click on the images to enlarge them. We the undersigned, administrative council of the 12th Dragoons, grant this certificate of “Congé Absolu” to Pierre van Dooren, trumpeter of the 1st Company of the 2nd Battalion, born 13 February 1787 in Weert, Department of the Meuse Inferieur. Height 170cms, brown hair, blue eyes, round forehead, broad nose, large mouth, no beard, round face, passbook number 1447. 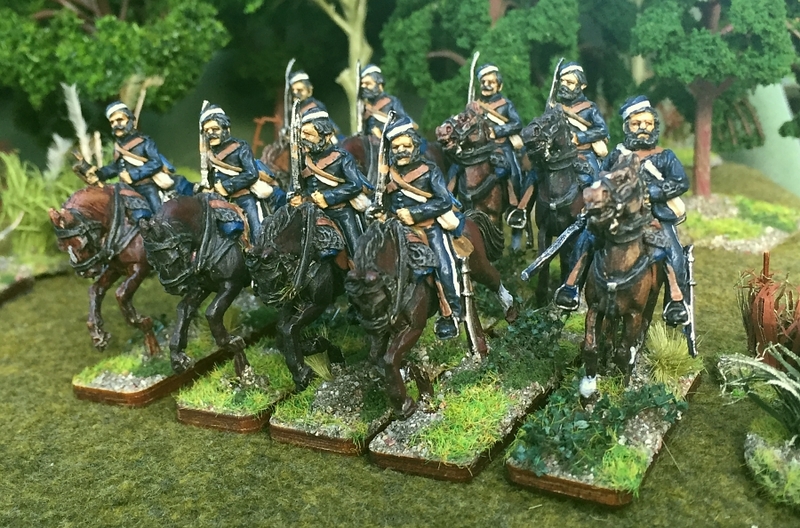 When I found the above transcript of the discharge papers of my great-great-great-great-great-great-great-grandfather, Pierre van Dooren, I knew that I just had to have the 12th Dragoons in my miniature army. And one of the figures had to be a trumpeter to represent my ancestor. Pierre entered the 12th Regiment of Dragoons on March 3, 1807, having left his hometown of Weert on February 12, 1807. With his regiment he was in Germany (1807- 1809) and Spain (1810-1813) before entering the final battle area in the northeastern part of France (1814). He was wounded in March 1814 and was recovering in hospital at Angers when Napoleon abdicated. 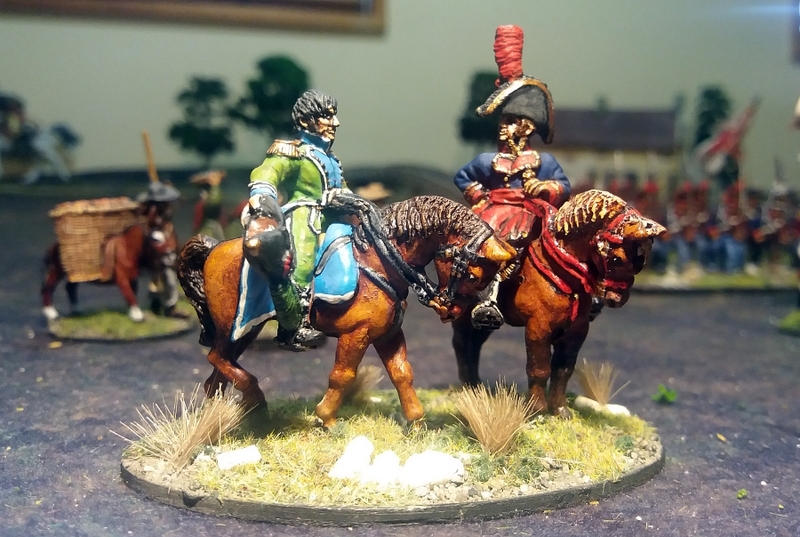 My miniature Pierre wears reversed colours from the other troopers (a crimson coat with green facings) in order to make him readily identifiable to his officers in this period when trumpeters might have to issue urgent orders in the midst of the smoke and turmoil of battle. He also has a white horsehair mane on his helmet rather than black, and rides a grey horse. Of the twelve figures in my unit, two wear the bearskin hats and red epaulettes that denote the elite company, the equivalent of an infantry battalion’s grenadiers. The others have imposing copper helmets with black horsehair manes streaming out behind. The officer has a leopard skin turban round his helmet, whilst the troopers have brown fur turbans. Because this unit is portrayed on galloping horses, I didn’t line them up straight on their bases. I have some horses racing slightly in front, while others lag behind. This gives a much more natural look to the speeding formation. 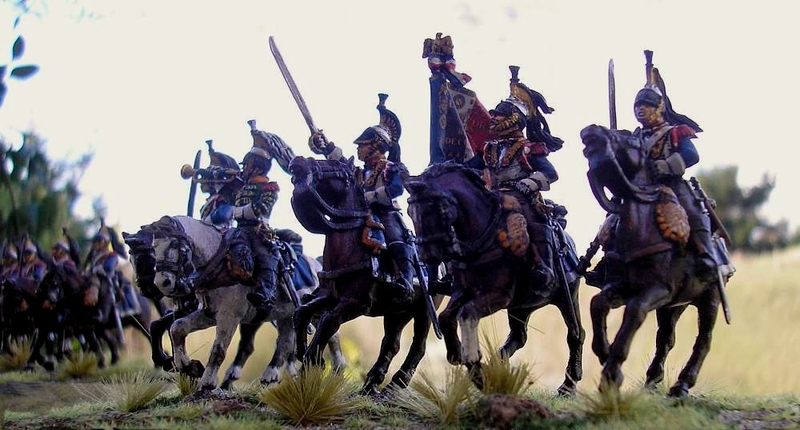 For as long as I can remember, whenever I think of Napoleonic uniforms, the flamboyant hussars come to mind first. 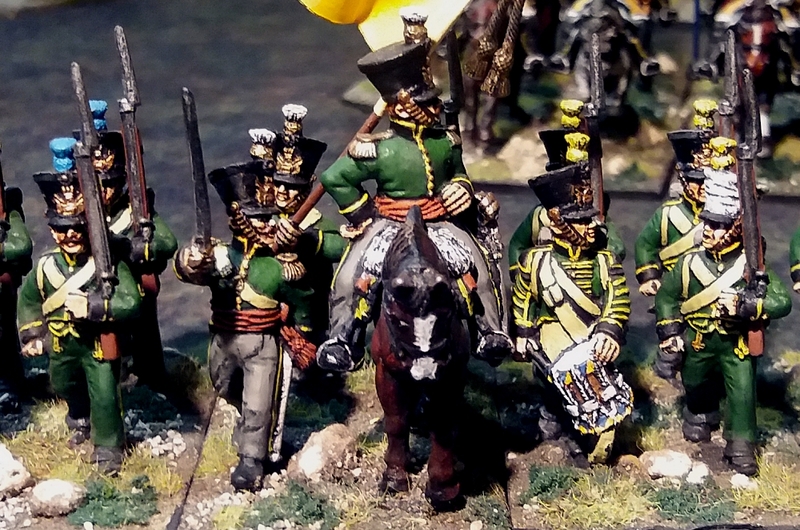 So I felt it was important to include a hussar unit in my miniature Napoleonic army. 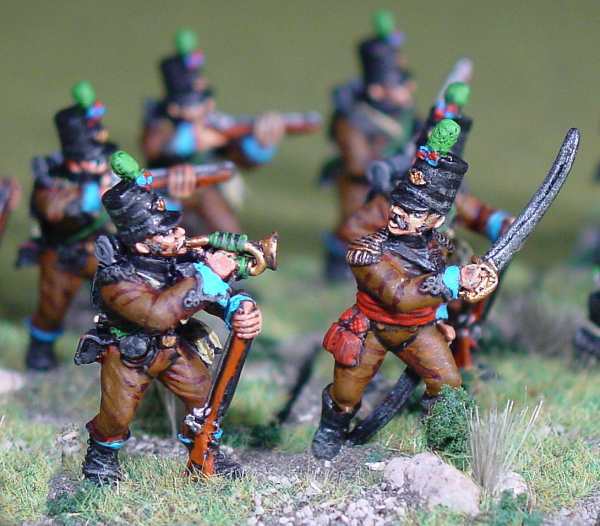 I bought these Front Rank hussars second-hand, and was initially disappointed that they were depicted in campaign uniform rather than in their exotic parade dress. But the end effect is still colourful and evocative of the era. 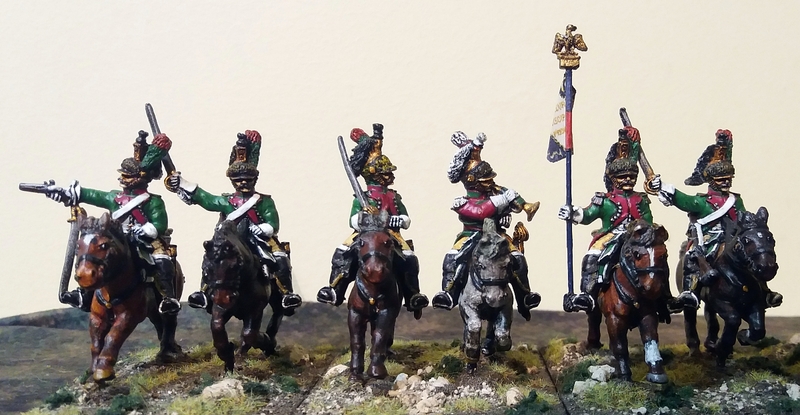 I decided to paint my unit as the 5th Hussars, based purely on the colours of their uniforms (especially the white pelisse and the red shako). 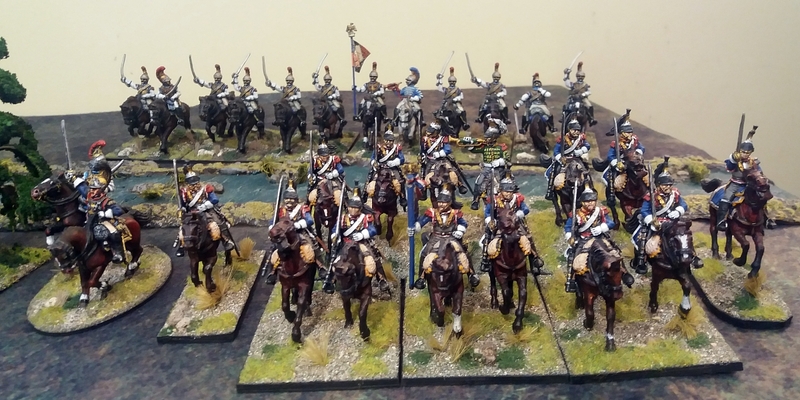 Like my other cavalry units, the horses are painted in oils rather than acrylics, which gives a much more natural look. 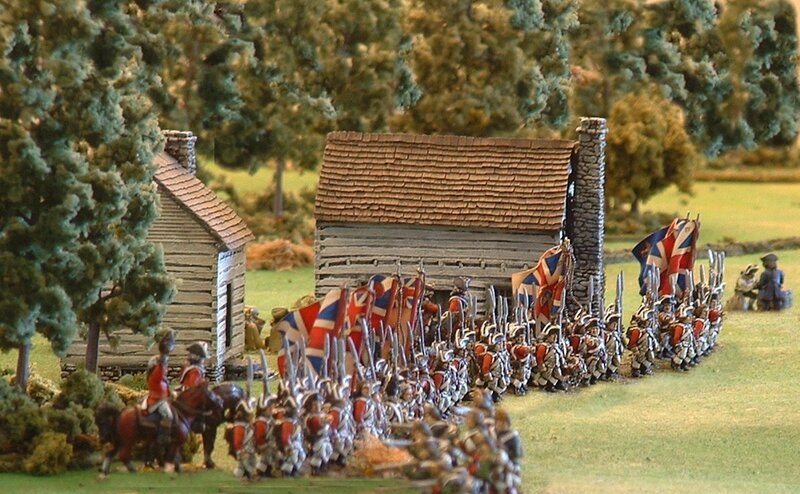 As these figures are wearing the post-1812 uniform with the tall round shako, I had to look for an 1812-pattern flag for the eagle-bearer. I couldn’t find such a flag online, so in the end I made my own by converting a Warflag image. 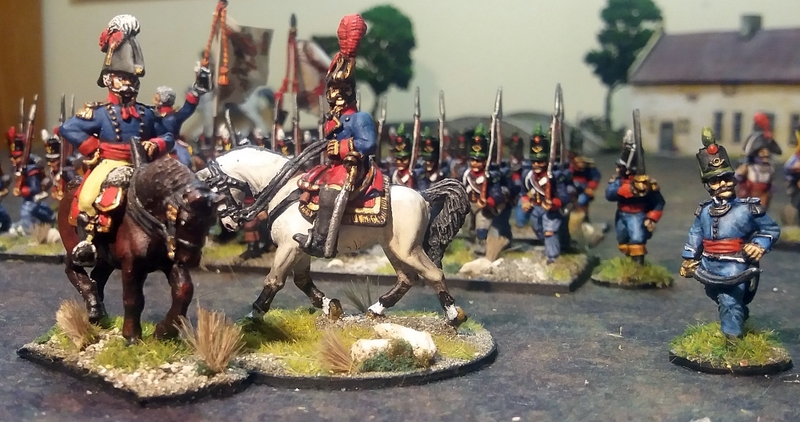 Strictly speaking, hussars at this time did not take their eagles on campaign, so my unit is incorrect in having an eagle-bearer. 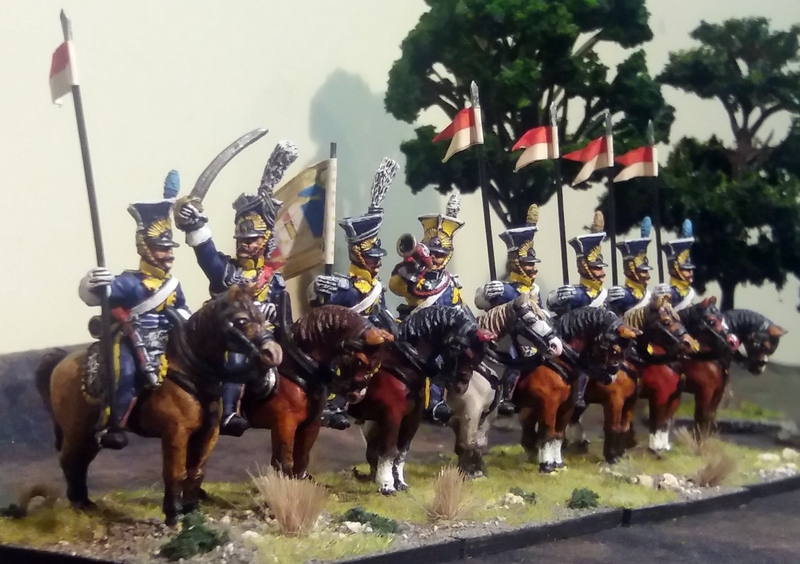 These blue-coated lancers in Polish-inspired uniforms were part of the Vistula Legion which transferred to French service in 1808. In 1811 they became the 7th and 8th Chevau-Léger-Lanciers. Their most famous action was at Albuera where they charged Colborne’s infantry. My 28mm Front Rank figures are wearing blue ‘kurtka’ jackets, except the trumpeter in reversed colours with a yellow kurtka. The square-topped hat, called a ‘czapska’, was typical of Polish units, both foot and mounted. 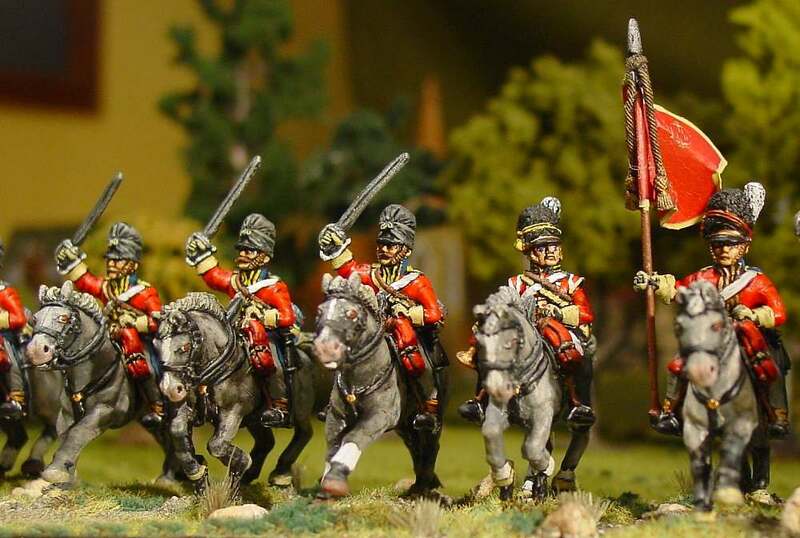 The miniature lances are from a New Zealand company – whose name presently escapes me. They are designed for ancient figures, so the lance-heads are not strictly accurate. However, they are strong – and very sharp! The lance pennons are by GMB Design. The unusual flag is a home-made scan from a book by Terry Wise. These are the only plastic cavalry in my army. 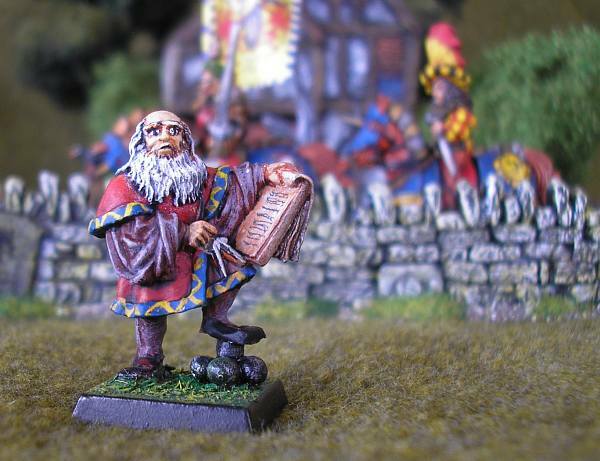 The figures are beautiful, as you would expect from Perry Miniatures. Plastic allows finer detail than metal (the plastic scabbards, for instance, are very intricate indeed). On the other hand, the casting method used with plastic means some things can’t be done as well as in metal, the most obvious example on these figures being the in-fill between the reins. But overall the effect of the plastic is a much ‘finer’ look than metal, I feel. Two different sets of arms allow you to have the figures either waving their swords in the air, or shouldering them – I chose the latter, except for my officer. I used my normal black undercoat method. The horses were all done with rubbed oils. 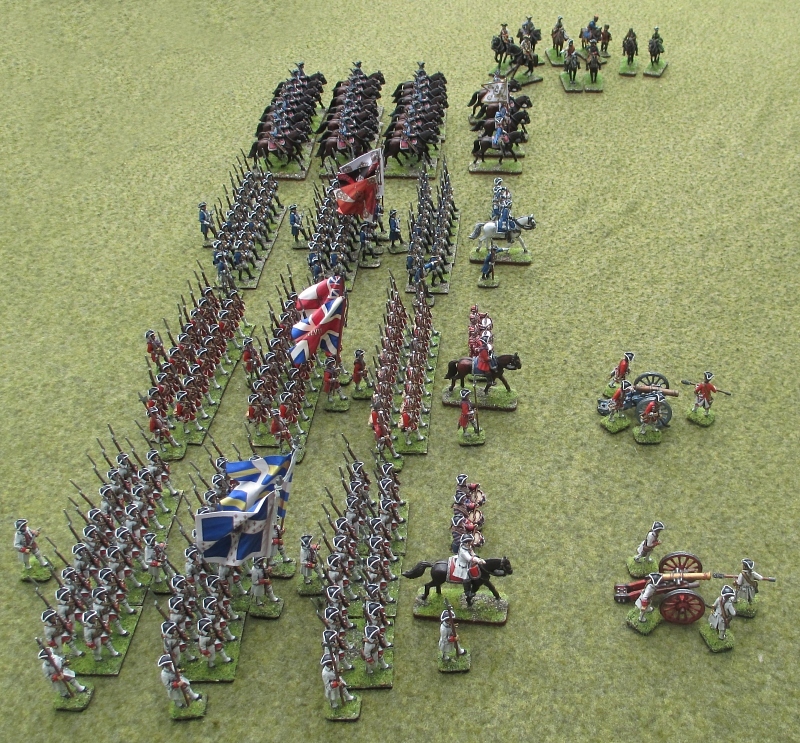 And the figures were painted with the Foundry three-colour system. 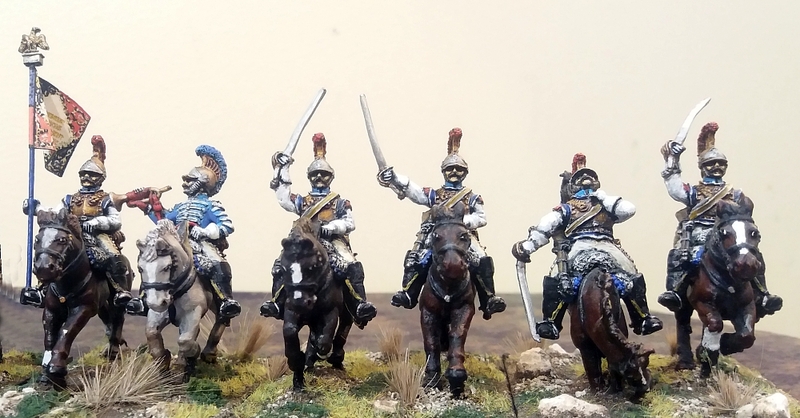 I chose to paint this unit as the 4th Cuirassiers in aurora facings. 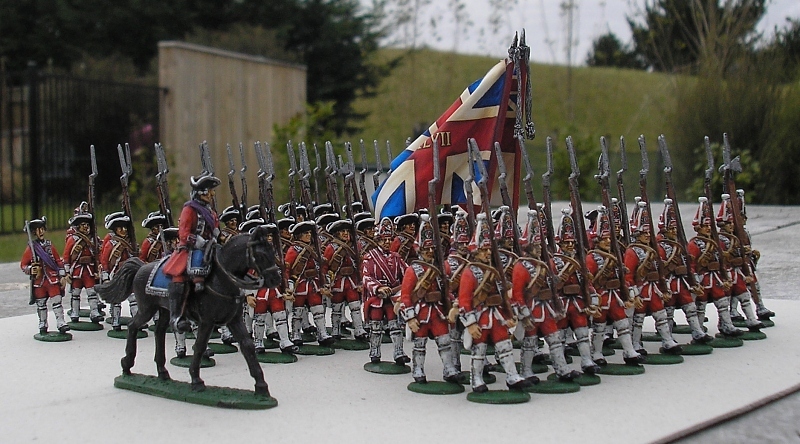 The Perry kit also included flags, which are very nicely done in an almost GMB-like style. Usually I would not have an elite regiment like the 1st Carabiniers in such a small army. However, I could not resist these miniatures when they were offered to me at a very reasonable price as part of a second-hand deal. 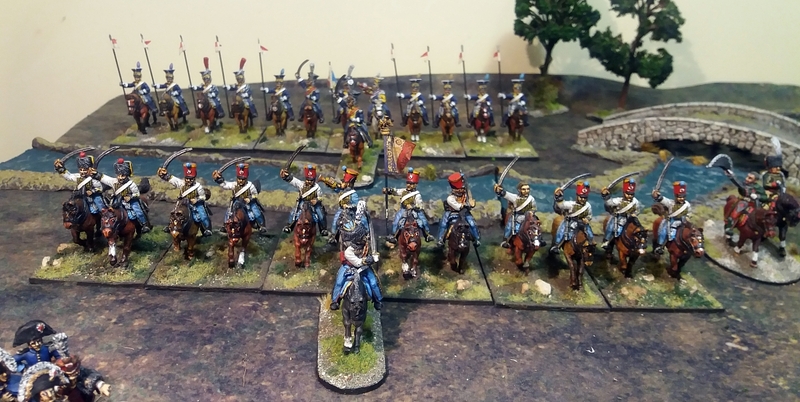 My initial plan was to paint them and then sell them, and with the proceeds buy a more appropriate cavalry unit. 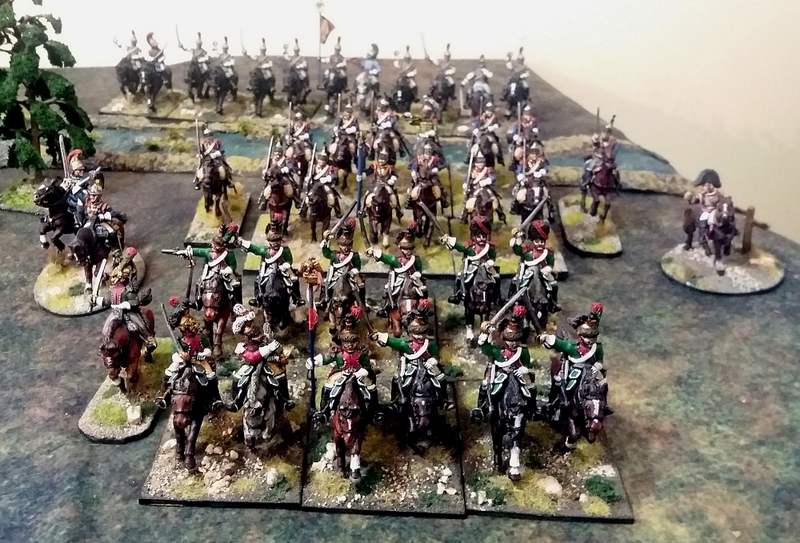 But with the time and effort I have lavished on painting my Carabiniers, in the end I couldn’t bear to part with them! The two units of Carabiniers in the French army (so-called because they were armed with carbines when they were initially raised by Louis XIV) were considered the elite of the heavy cavalry. Until 1811 they wore blue uniforms with large bearskins. My models depict the later white uniform, complete with copper-plated cuirasses and elegant Grecian-style helmets. I did the cuirasses and helmets using the same technique I use on gun barrels. I left the metal bare, which of course meant I couldn’t use spray undercoat as I usually do with my figures. I then brushed on and rubbed off GW Flesh Ink. Finally I highlighted the cuirasses by dry brushing them with metallic gold paint. I’ve started a long-overdue inspection of all my wargames figures. 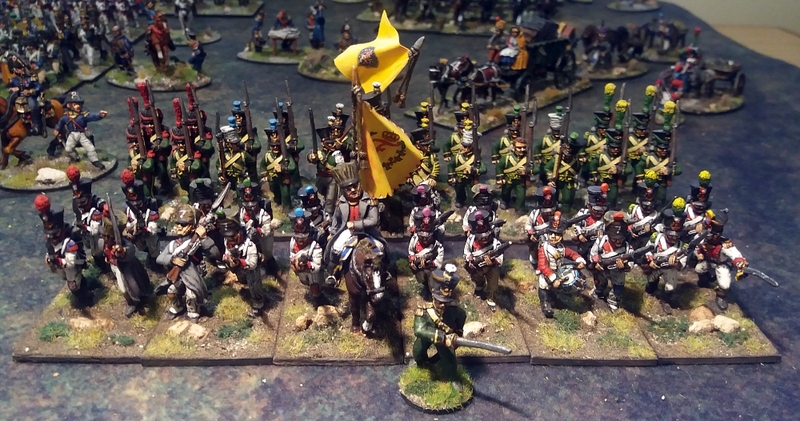 After the Napoleonic-era British in my last posting, it’s now the turn of the Spanish. These were mostly painted from about 2003 to 2008. 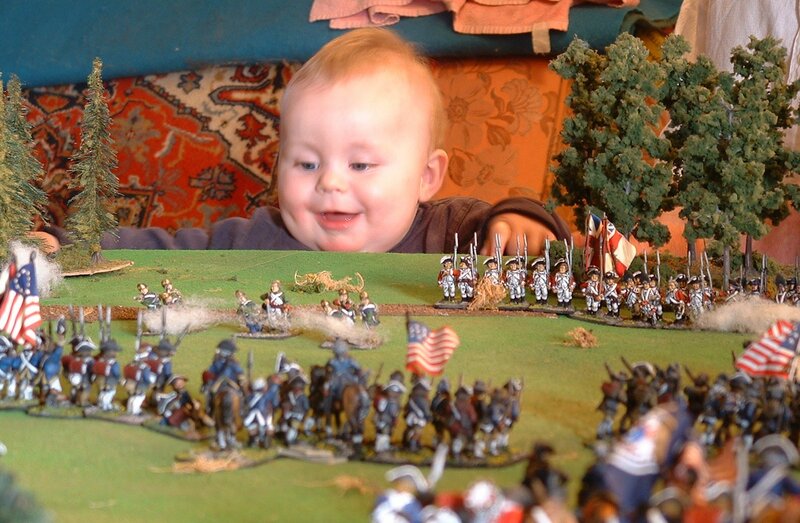 As with all my Napoleonic armies, I haven’t stuck to one particular order-of-battle, nor indeed to one particular year. So you’ll see my army contains units that never fought together at the same place or time. 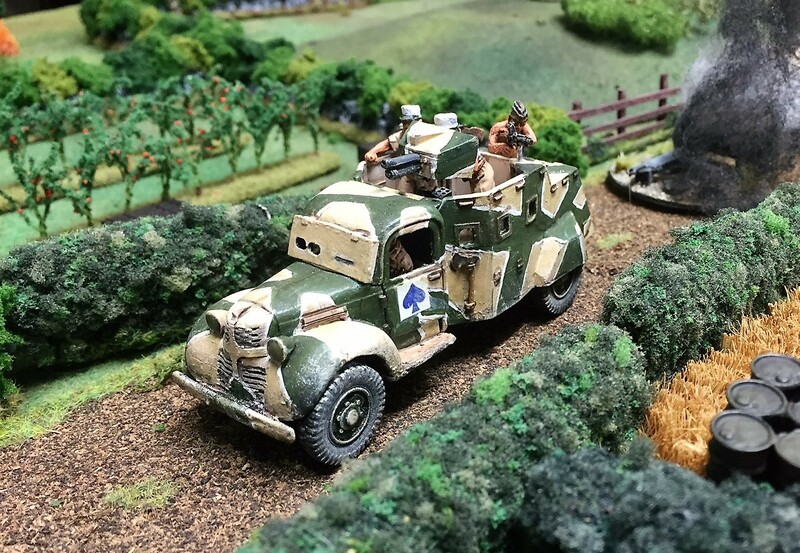 My only criteria for a unit to join my army is that it looks good – and the Spanish certainly provide lots of scope for that. For example, just wait till you see the cavalry near the bottom of this posting! 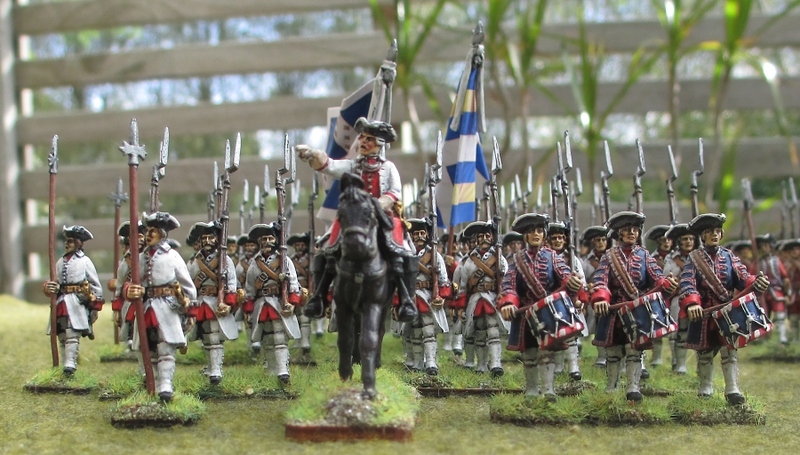 I painted these Front Rank figures as the La Princessa Regiment, wearing their pre-1808 uniform, as they would have appeared in General Romana’s expedition to Denmark to support the French. They can therefore fight on either side, as they mutinied in Denmark, were rescued by the British, and fought in the Peninsular War. As they marched through Hamburg on their way to Denmark, they were illustrated by the Suhr brothers, and it is quite clear from their drawings that they wore a mixture of the older blue and current white uniforms. Therefore I painted some of the officers and the sapper in blue uniforms. One particular feature of Spanish grenadiers were the ornately-decorated bags hanging from the backs of their bearskins. These were devilishly tricky to paint! 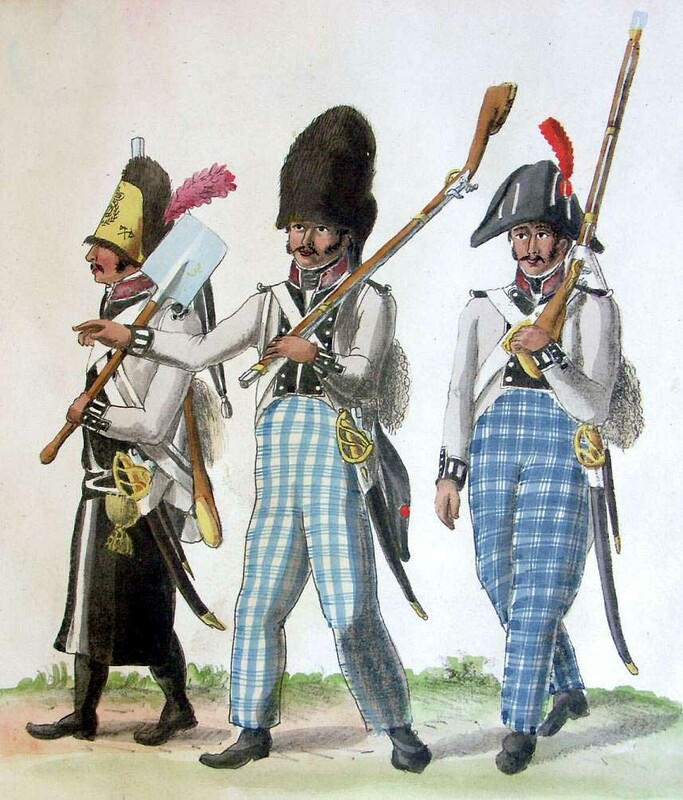 The brothers Suhr also showed the blue-checked trousers some men sported whilst passing through Hamburg – I dressed two of my soldiers in these. 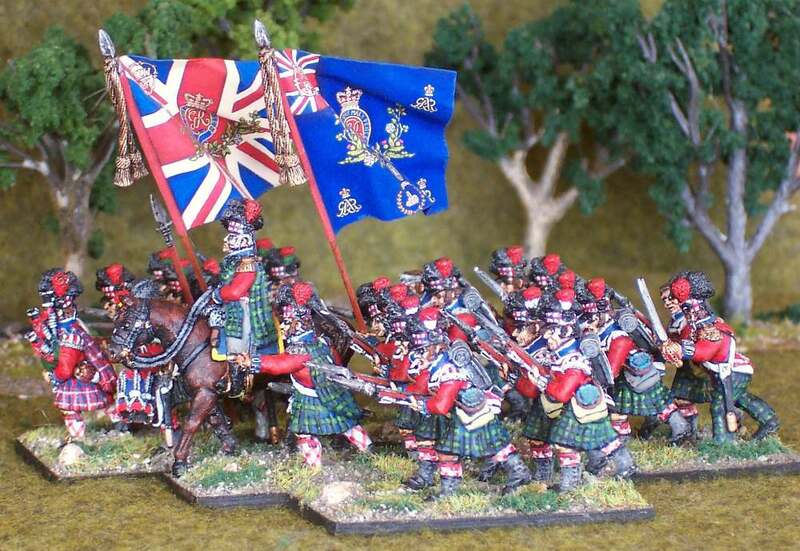 Plus I painted a few variations of breech and gaiter colours to give a campaign look to the regiment. A shame, though, that Front Rank don’t model their Spaniards with cigarettes in their mouths, as this seems to have been almost a uniform item for Romana’s expedition! Note the boy fifer. He is also modelled after Suhr, though Front Rank have increased his height – in the original Suhr drawing he appears no more than about one metre tall! The flags are by GMB Designs, as usual for me. Unfortunately they did not produce the actual flags for La Princessa, but as the designs of all Spanish flags were fairly similar except for the small crests in the corner, I thought this would be close enough. 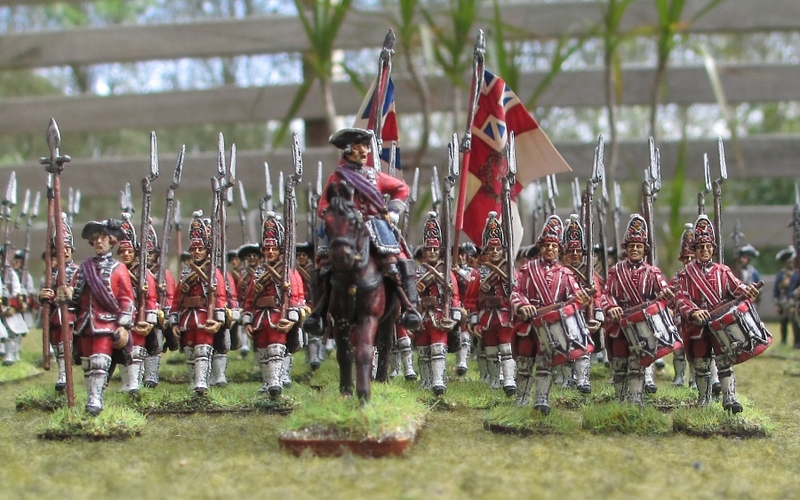 These Front Rank Spanish are wearing the uniforms that were supplied by the British from about 1812 onwards. This can be seen in details such as the style of the shakos (though the coloured ribbons tied round them are a unique Spanish characteristic). 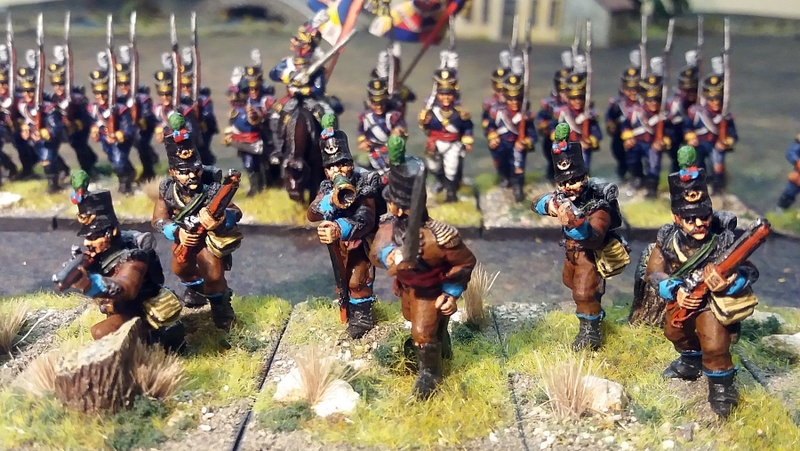 There is some conjecture as to whether Spanish infantry wore dark blue or light blue trousers – I opted for the latter as I thought they looked more colourful. Spanish soldiers such as these formed the back-bone of Morillo’s division, which fought well in the latter parts of the Peninsular War. 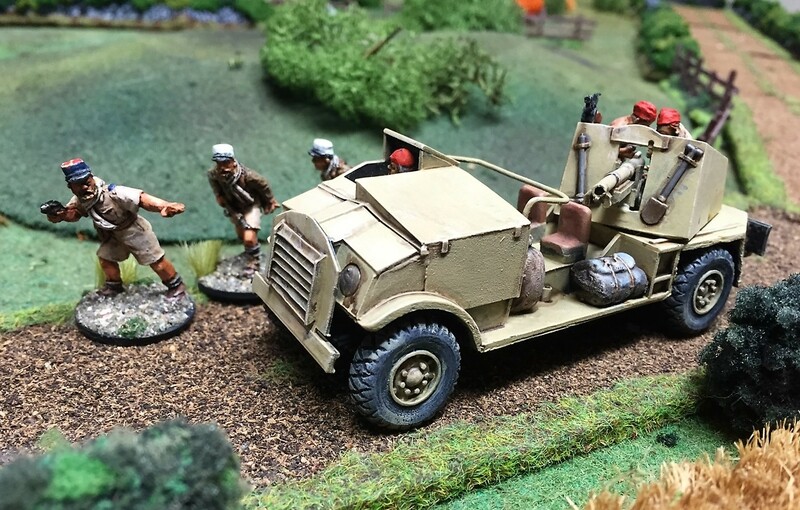 Cazadores were the Spanish light infantry. 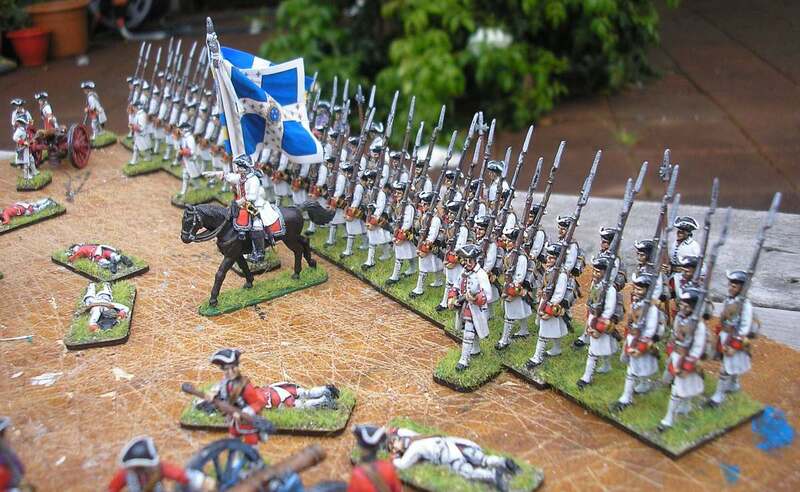 I’ve painted this unit in their post-1812 light blue uniform. 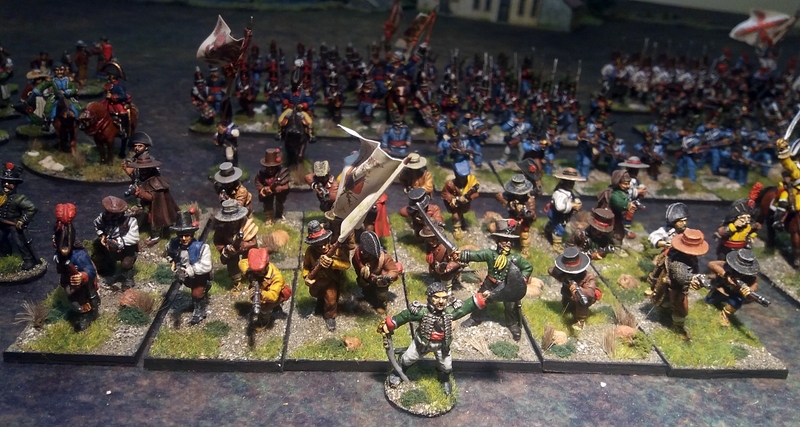 As with most light troops in my miniature armies, I attached fewer figures on each base than for line infantry battalions, and mixed up the poses to give the effect of skirmishing. 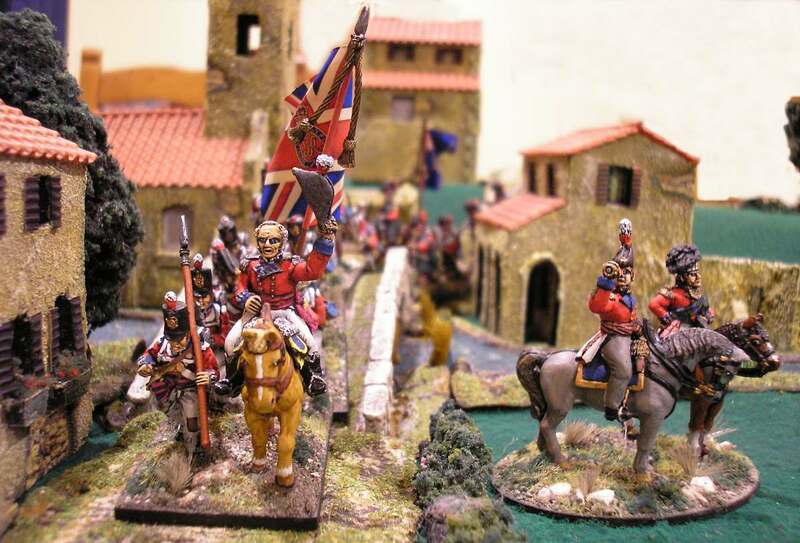 The individually-based figure in the brown and yellow uniform is a Spanish officer figure from Brigade Games. I love his portly stature and casual stance. 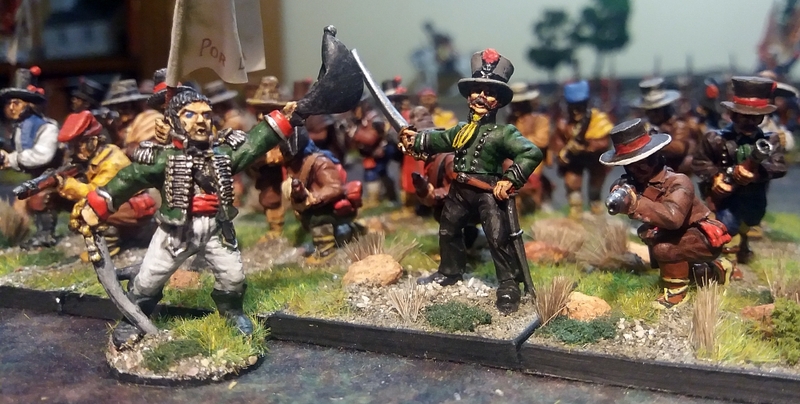 The sculpt appears to have been based on the Dennis Dighton portrait of Don Juan de Gonzalos, colonel of the Regimiento Imperiales de Toledo, right down to his bushy sideburns and his pose of smoking a cigarette (Spanish soldiers of the period were notorious smokers). In the Osprey book Spanish Army of The Napoleonic Wars (2) 1808-1812 there is an illustration of a soldier wearing a simple grey uniform that was supplied by the British in 1810. I thought this rather nondescript uniform might make a change from the more ornate Napoleonic uniforms I had hitherto painted. I also got a bit brave with this battalion of Front Rank figures, having a go for the first time at swapping heads. If you look closely at the pictures, you’ll see some of the soldiers are wearing civilian headgear which I chopped off some spare Front Rank guerillas. Even more daringly, I changed some feet so that a couple of the soldiers are now wearing espradilles (sandals), which also came from the guerilla figures. I’d always fancied a unit of Front Rank’s Spanish guerillas – they looked so enticing in their catalogue. So I finally treated myself, and, boy, was I pleased with them! These would have to be some of the nicest figures Front Rank have produced. The detail is very well done – even the hairnets worn in some parts of Spain are faithfully reproduced. The officer with the top hat is a particularly nice rendition of Jose de Espin, one of Don Juan Martin’s chiefs. 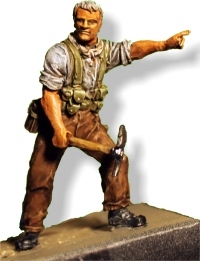 This figure is based on a Dighton painting, right down to the deaths-head badge on his hat. The other officer is wearing a rather ornate older-style cazadore uniform. 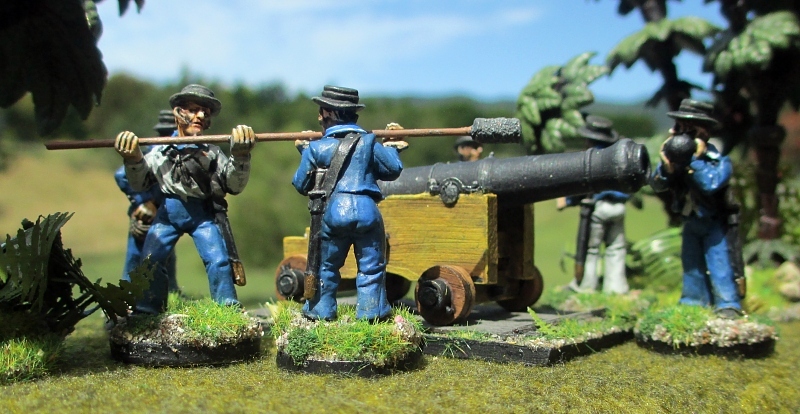 I’ve also added a small baggage train for my guerilla band – they would make a great objective for a scenario-based game. 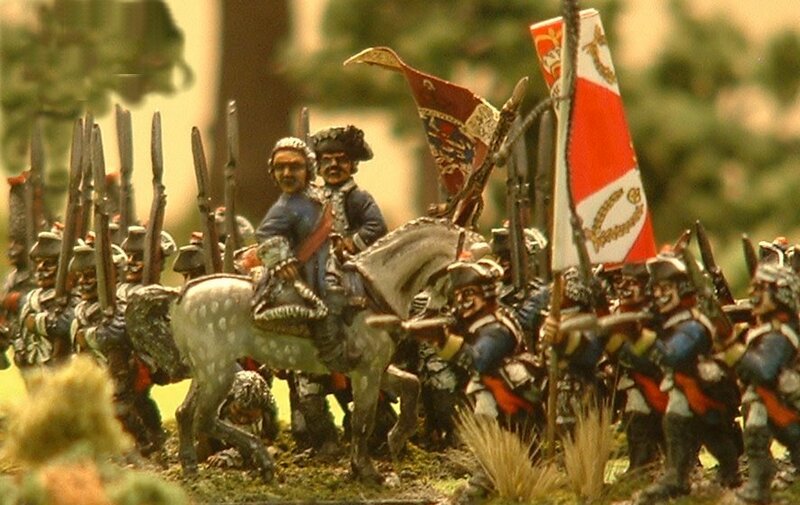 The light blue facings of this dragoon regiment indicate that they are the Regimiento de Dragones de Almansa. When I started painting these, I initially thought that the yellow uniforms combined with the red plumes and blue facings would be too much of a ‘Noddy’ effect! But in fact they look splendid on the table. 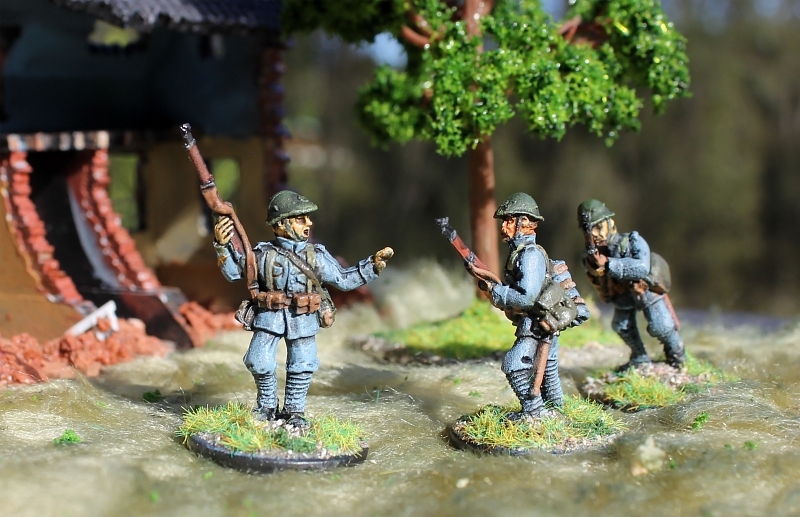 The figures are 28mm Front Rank Figurines. I used Foundry’s triple paint-set of yellow shade, main and highlight, along with a coat of gryphonne sepia ink at the halfway-point. The horses were painted using my usual oil-paint technique. This entails spray-painting the horses with rust-coloured car primer, then painting on black or burnt sienna oil paint, and immediately rubbing it off again with a tissue so the rust primer shows through – quick and dirty, but effective! The flag is somewhat generic, being copied out of a flag book, then flipped to make the reverse side. So it doesn’t represent any real Spanish dragoon unit, but is near enough for my purposes. These Front Rank generals were painted years before I began experimenting with layering, so the colours are quite flat. In the top picture, a couple of haughty Spanish general officers ride in front of the infantry. One general is wearing the full-dress red breeches. And if red breeches weren’t colourful enough, that is nothing to the candy-coloured light green and blue uniform of the ADC! This figure is based on a Dighton print of Lt.Col. Lardizabel, aide to General Ballasteros. 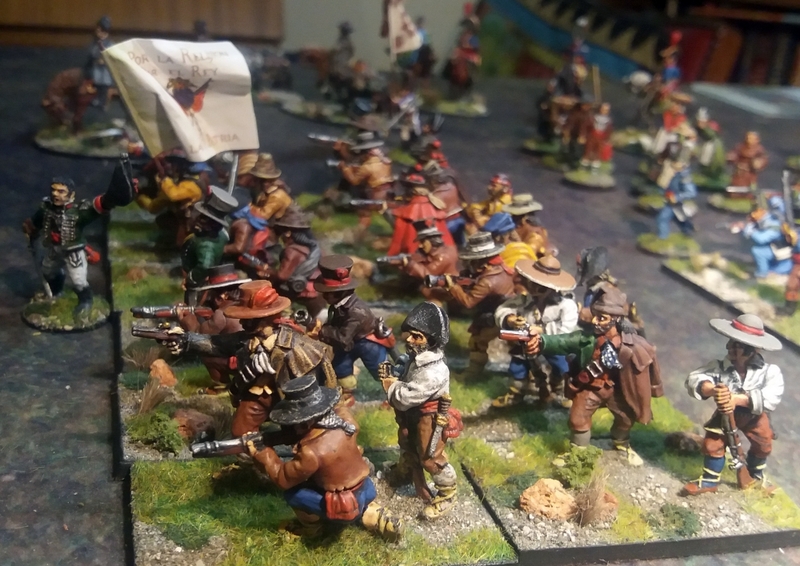 The Perry twins produce a couple of very nice sets of Spanish civilians, perfect for populating a village on the Peninsula or watching as their boys march off to battle. I particularly like the old woman in the traditional black dress. 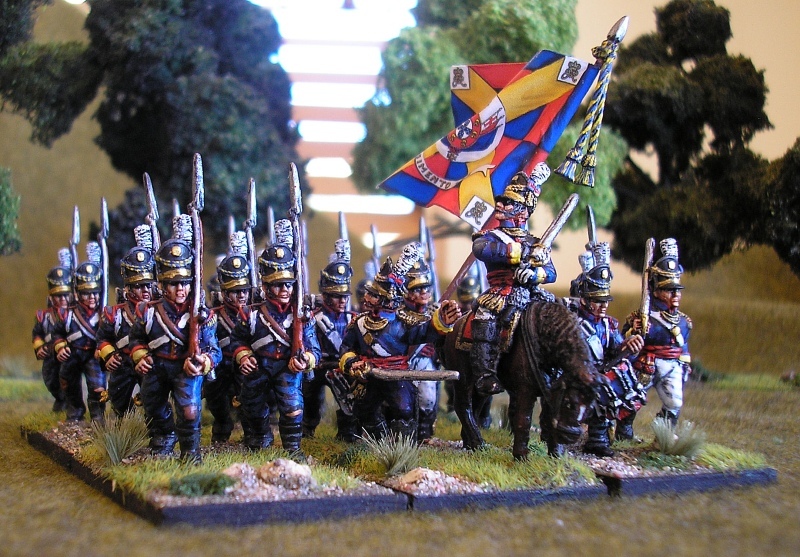 So there we have it – a small but varied Spanish army. It is probably too small, and lacking in artillery, to fight by itself. But it makes a good allied force with my British. A military parade of the entire army of my ‘imagi-nation’, the Barryat of Lyndonia, has been long overdue. 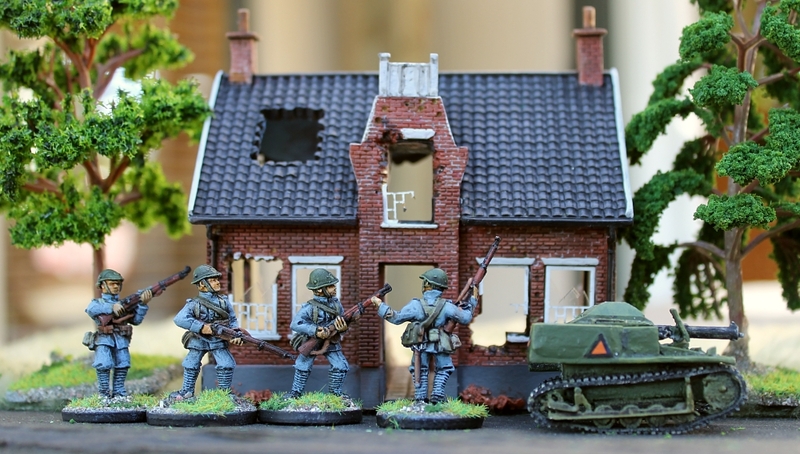 But today a combination of being on childcare duty at home whilst my wife works, and some lovely autumn light for picture-taking, inspired me to set out all the 1/56th scale Minden Minatures figures I’ve painted so far. 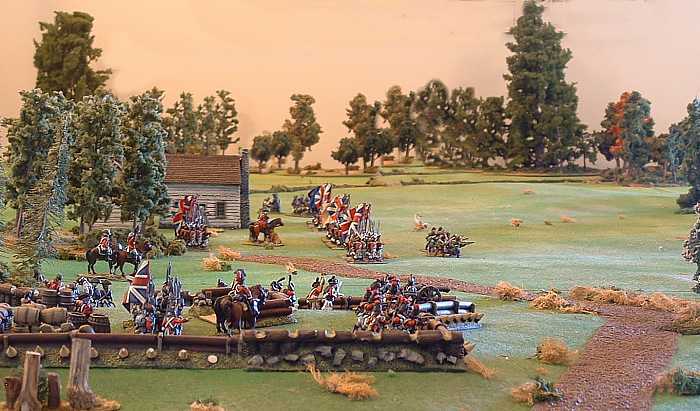 To fill in those who don’t know about the Barrayat of Lyndonia (ie nearly everybody in the world), it is an imaginary nation – or ‘imagi-nation’ – I’ve created for my wargaming army, based on the Stanley Kubrick movie, Barry Lyndon. The Barryat does not recruit its own army, but instead contracts regiments from other states in Europe – which provides the backstory to allow me to mix and match whatever real-life nations’ units I wish. 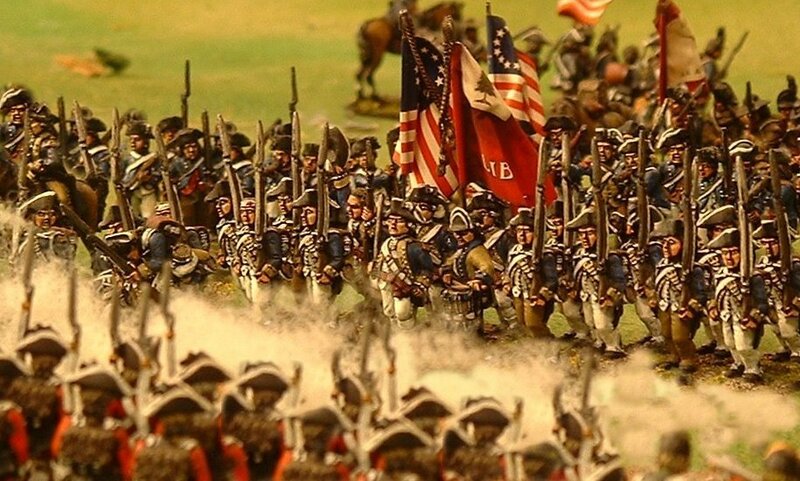 Instead of pursuing historical accuracy when painting my figures, I’ve attempted as much as I can to depict my soldiers as they appear in the movie, historical inaccuracies and all. 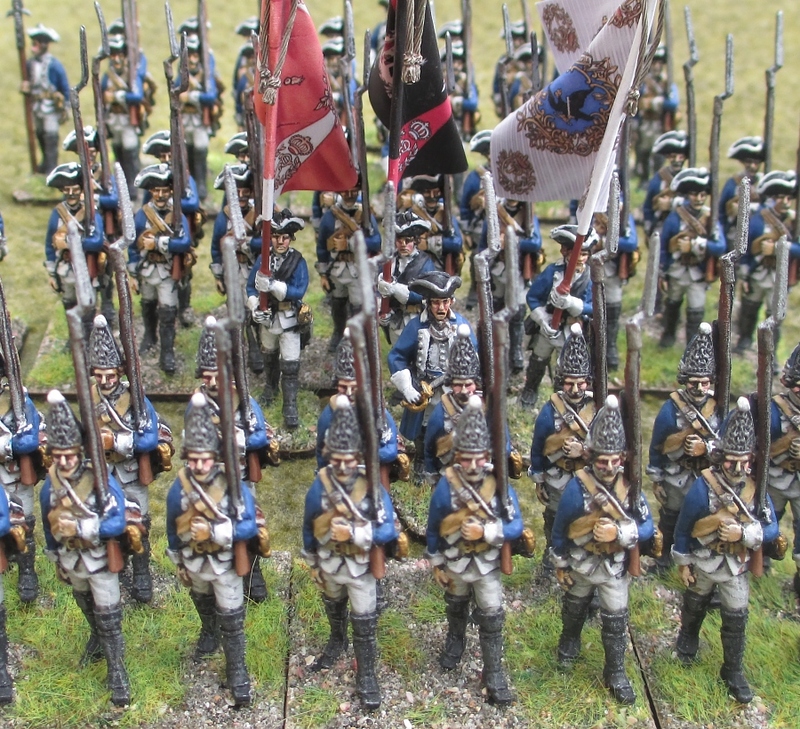 Therefore when some expert in military history tells me that the turn-backs on my Prussians should be red, not white, or that they can’t possibly have those three flags together in one regiment, I can point out my figures aren’t representing real Prussians, but rather Kubrick’s take on them. The guests of honour are some famous personalities from nearby real-life countries, including the Prussian King Frederick the Great and the Austrian Prince Charles of Lorraine. Also present are a number of the local gentry and their ladies. 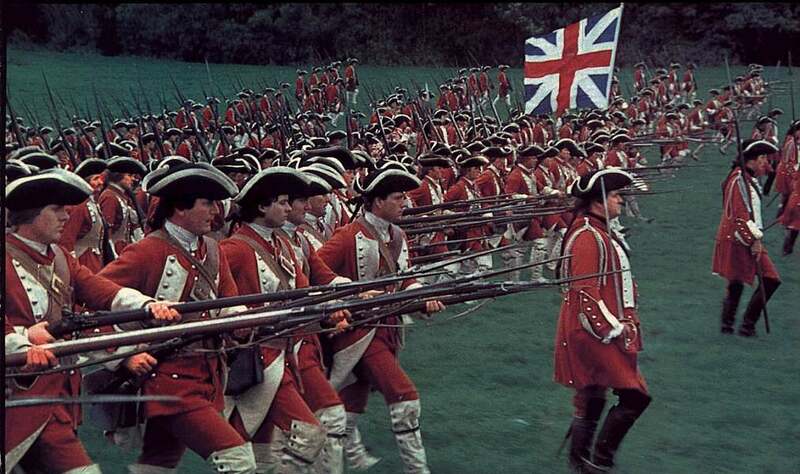 A long line of red emerges from the trees, as Gale’s Regiment of Foot, a fictional regiment from the movie, approaches the parade ground. By the way, I think that the above picture is especially cool when clicked on to bring it up to full size. After having marched onto the parade ground in line, they’ve now deployed into column of companies (my infantry regiments have three companies per regiment). Headed by Lt Colonel Charles Gale, the officers include the Irish adventurer Captain Grogan, the foppish Lieutenant Jonathon Fakenham and his ‘particular friend’ Lieutenant Freddie, whose surname is not disclosed in the movie. The movie depicts the drummers wearing tricornes instead of mitre caps, but I’ve kept to the latter because I like their mitres so much – and because that is the way the Minden drummers come. 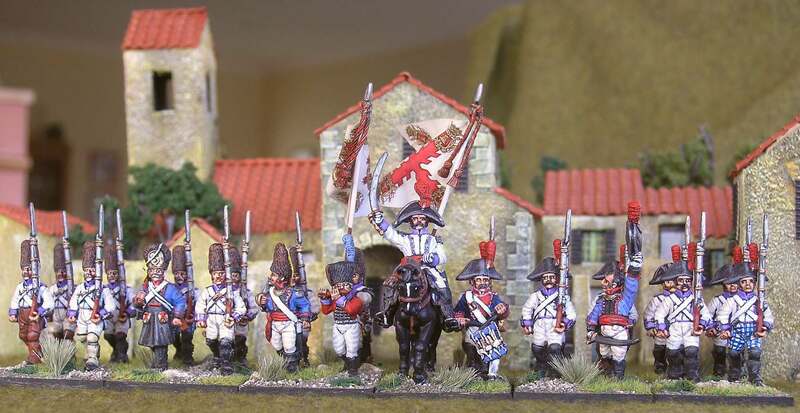 In the movie, the regiment has no grenadiers, but I have added these, again simply because I like their colourful and intricate mitres so much – and what better reason could there be than that?! They were tricky to paint, but I think the final effect is worth the effort, and they’re my favourite figures in the whole army. Somewhere in the ranks will be Private Redmond Barry, the main character in Barry Lyndon. He joined Gale’s Regiment of Foot after being tricked into a duel back home in Ireland. Captain Grogan has now taken young Barry under his wing, and Lieutenants Jonathon and Freddie will later provide him with an intriguing opportunity for Barry to improve his status in life (you’ll need to see the movie to find out exactly how this happens!). 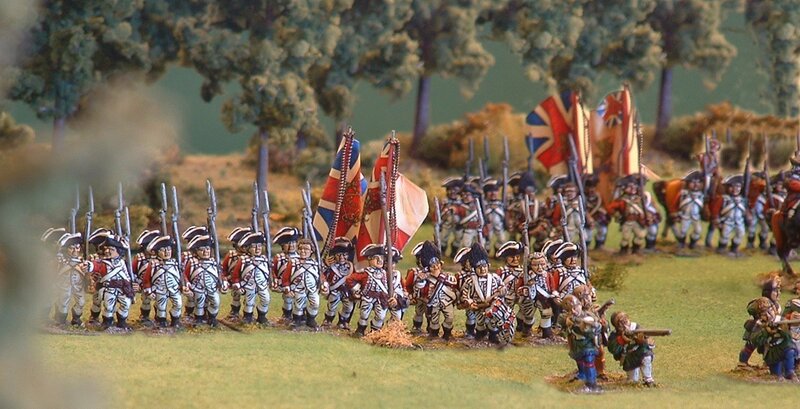 Following Gale’s Regiment of Foot, the Régiment de Royal-Cravates enters the field. 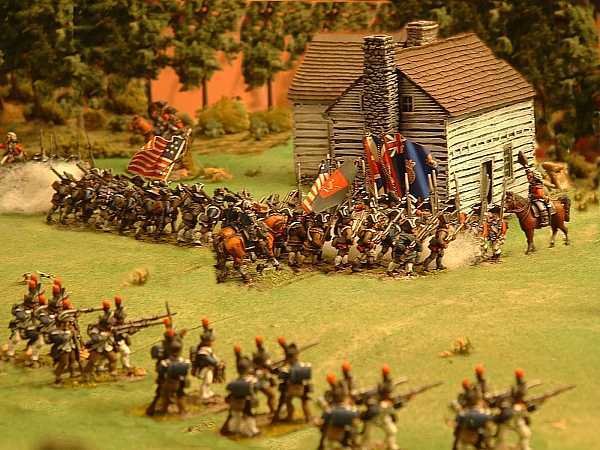 In the movie, this is the French regiment that Barry faces in his first taste of battle, “only a skirmish against a rearguard of Frenchmen who occupied an orchard beside a road down which the English main force wish to pass”. The narrator in the movie goes on to say that though this encounter is not recorded in any history book, it was memorable enough for those who took part. The drummers in their royal livery were tricky to paint, with all that red and white lace. But I’m pleased how they came out in the end. Whilst un-named in the movie, in the original 1844 William Makepeace Thackeray novel, the French regiment that Barry marches against is called the Régiment de Royal-Cravates, so that is who they are in the Barrayat of Lyndonia. 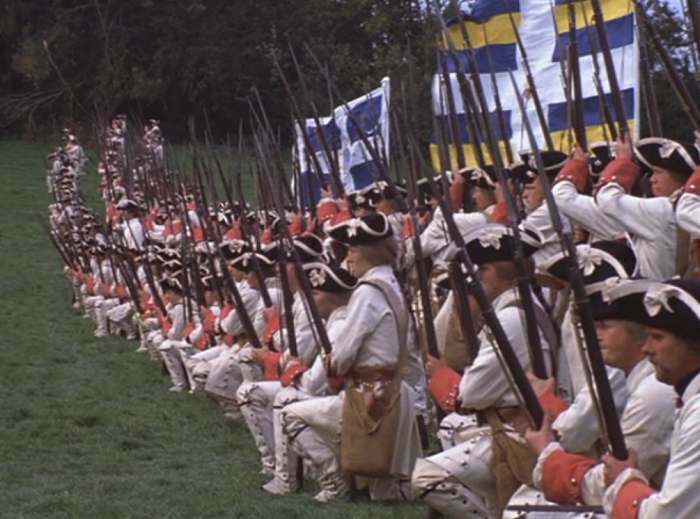 The Barryat of Lyndonia’s French regiment replicates the incorrect facings and flags as per the movie. 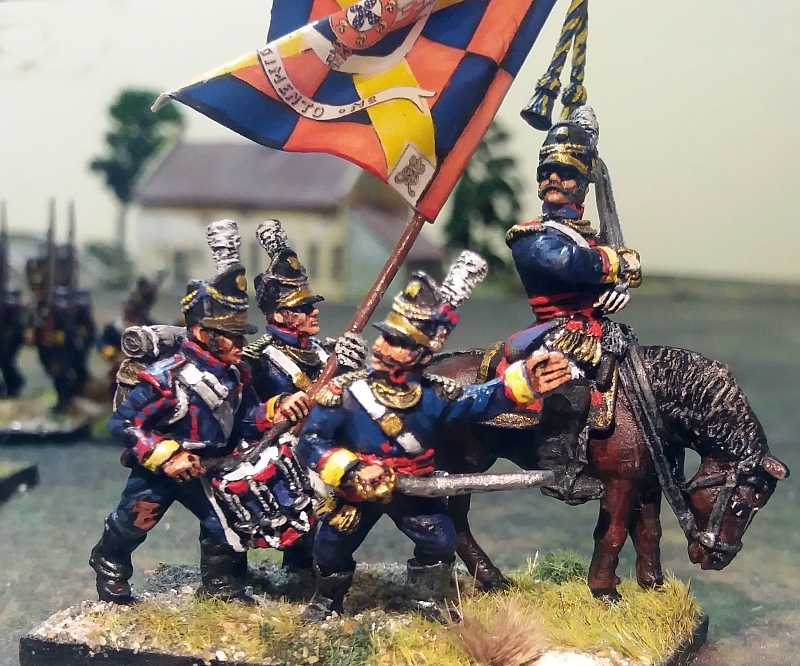 The flags are actually those of two real French regiments, the Grenadiers Royaux and the Régiment de Flandre, yet the uniform facing colours are incorrect for both. The last foot battalion onto the parade ground is the Kubrick Infanterie Regiment, led by Captain Potzdorf on his distinctive white horse. The movie doesn’t name this Prussian regiment, which Barry is forced to join after being captured as a deserter. So in the Barryat army it is named in honour of the movie’s famous director, Stanley Kubrick. I hope he looks down on this with approval! OK, so the movie doesn’t have any grenadiers in mitre caps. But, like Gale’s Regiment of Foot, I really wanted some of those smart-looking guys, so I’ve conjectured how Kubrick would have shown them, had he wanted to. 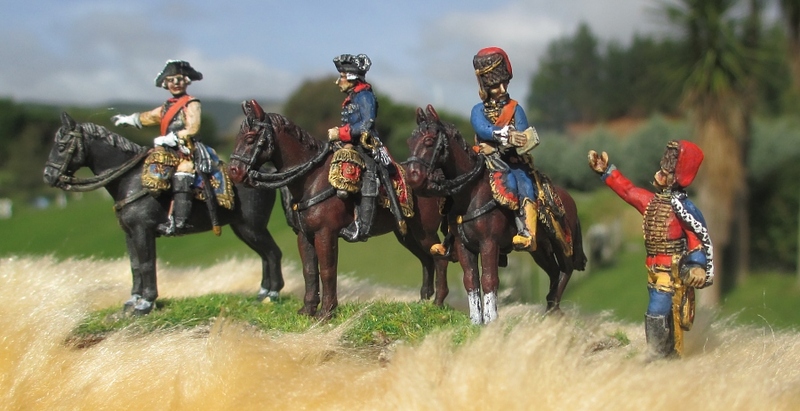 Basically, they’re the same as his somewhat inaccurate Prussian musketeers, but wearing mitre caps instead of tricornes. The movie’s inaccuracies are all faithfully recreated! 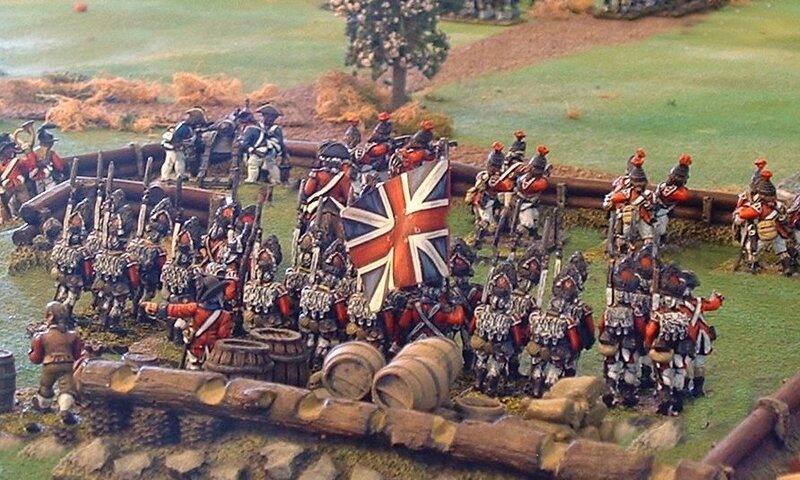 The soldiers’ coats have the wrong coloured turnbacks, they wear incorrectly coloured straps, and carry mismatched flags (the orange, black and white flags in the movie are actually from three different real-life Prussian regiments). 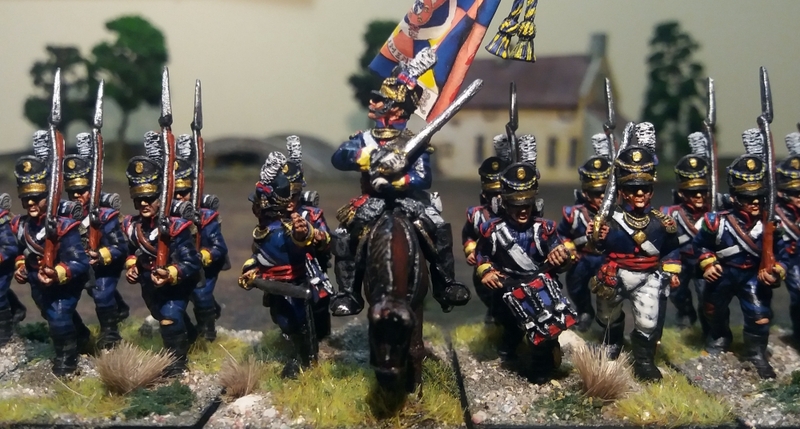 The sound of jingling bridles and trotting hooves announce the arrival of the only cavalry regiment in the Lyndonian army, the Truchseß Dragoons. This regiment is the first unit that veers away from the movie. 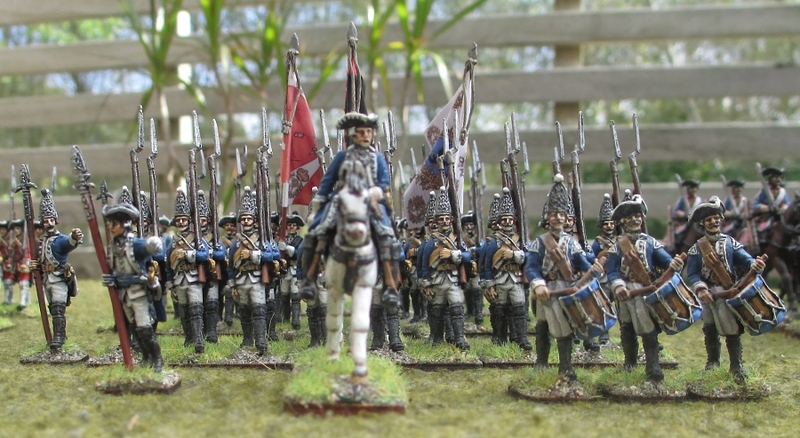 While there were some small numbers of rather plainly-dressed Prussian cavalrymen in some scenes in Barry Lyndon, I went for the real-life Prussian Truchseß Dragoons merely because of their splendid light blue and pink uniforms. Another perfectly good reason! 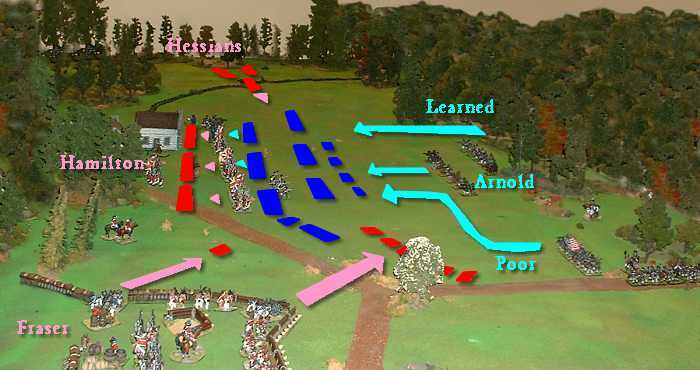 In the finale, the whole army masses behind the two guns of the Barryat of Lyndonia army as they prepare to fire a salute. 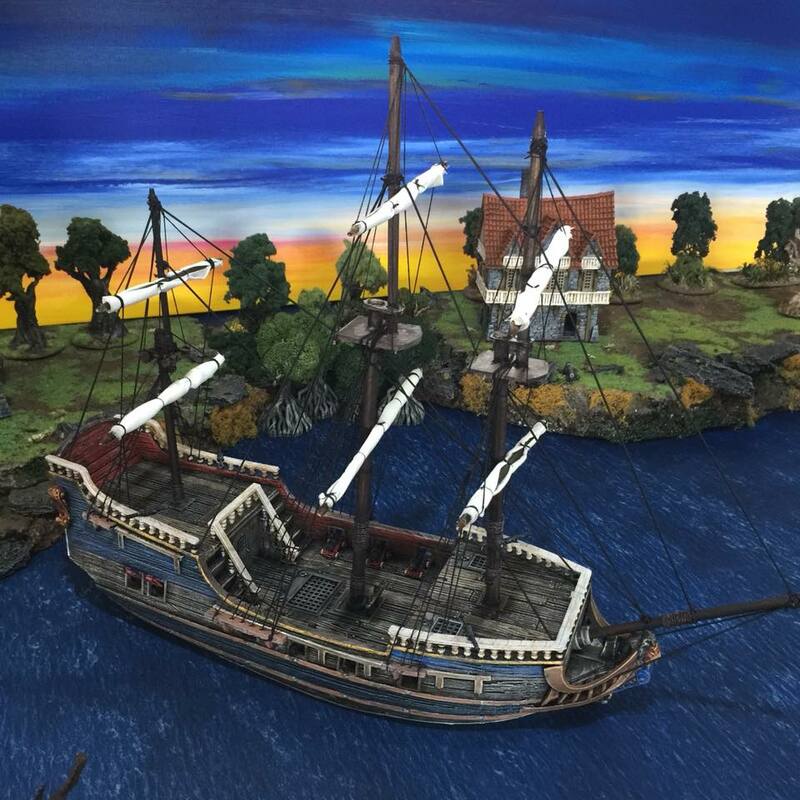 The French gun in the foreground is modelled on one that appears briefly in the movie. 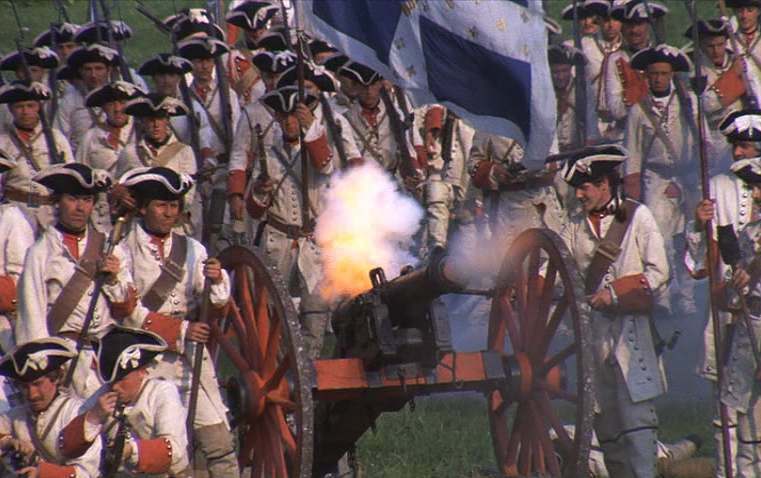 The gunners in the movie wear the standard white infantry coats rather than the blue and red French artillery uniforms. This is actually correct, because small battalion guns such as these were manned by men assigned from the regiment, not Royal Artillery gunners. I’ve done the same with the British gun, manning it with crew assigned from Gale’s Regiment of Foot. The visiting Prussian king, Frederick the Great, is so impressed with the turnout of the Barryat of Lyndonia army that he has instructed his hussar general, von Zeithen, to write a note of congratulations, which the latter is now handing to a courier to convey post-haste to the Lyndonian palace. 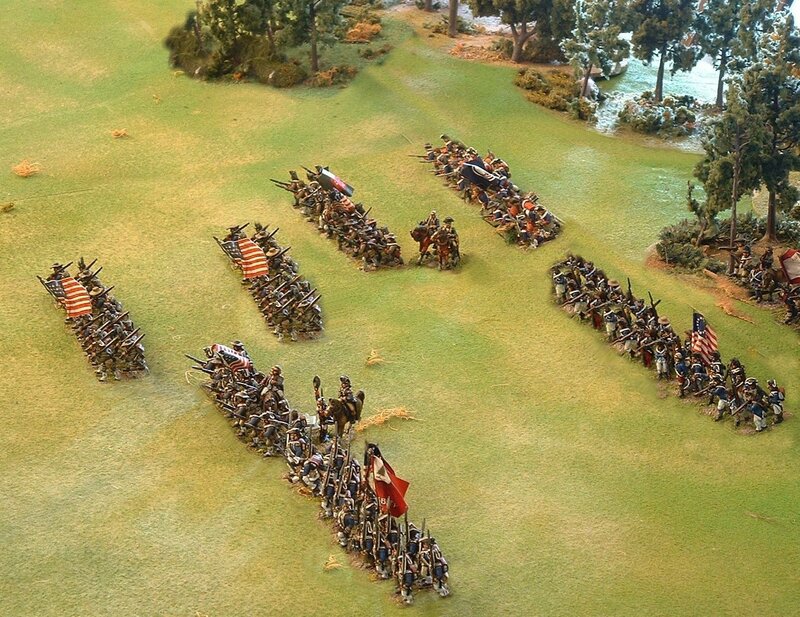 At last, 60-plus figures all painted and based into one impressive big battalion. My photo came out nice, too, in my humble opinion! 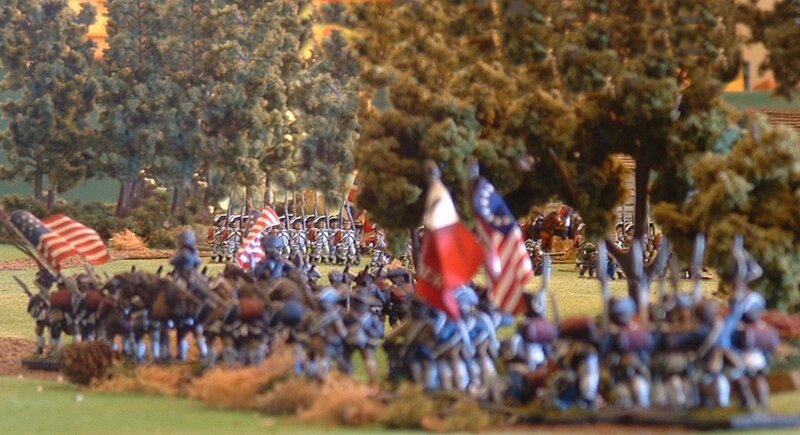 It is quite a long picture, so click on it to see the full effect of the large battalion in all its glory. Shame the officer carrying the white flag toppled over without me noticing whilst I was taking the photo. 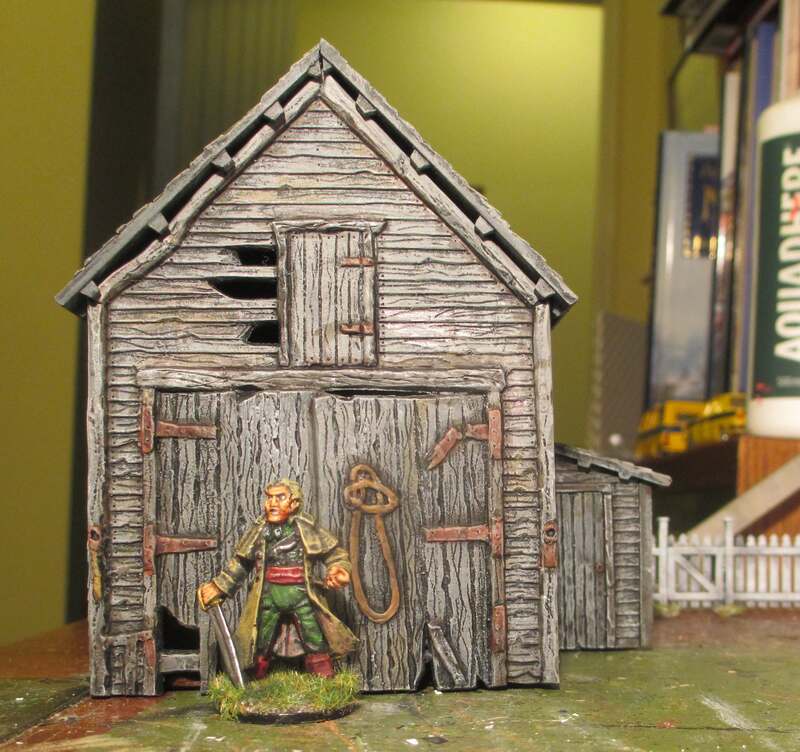 Anyway, this afternoon I attached the final piece of flock to the last figure in my 28mm Minden Miniatures Prussian battalion. It’s taken me a year to paint just this one unit, but I’ve finally got there! 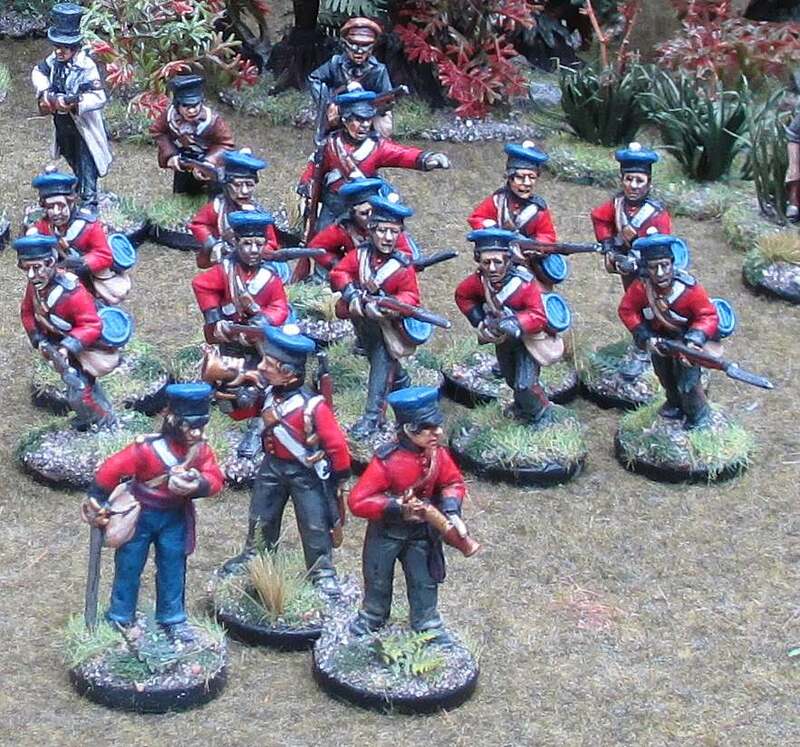 This battalion of 28mm figures is based on the Prussians in the movie Barry Lyndon. So I’ve copied the inaccuracies in the movie. 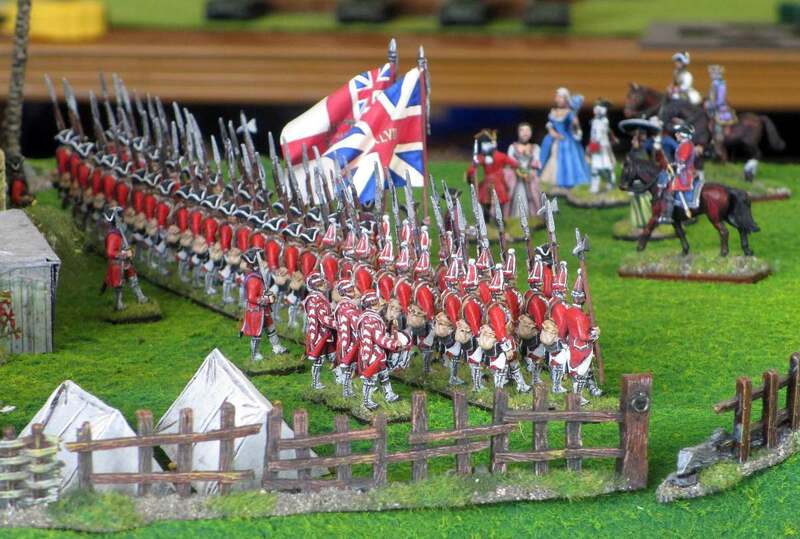 You’ll see the wrong colour turnbacks, the incorrect colour straps and the mis-matched flags, all faithfully recreated! The movie doesn’t name the regiment, but in the book it is called the ‘Bulow’ Regiment. The orange, black and white flags carried in the movie are from different real-life regiments, but for my purposes, they will be the flags of the imaginary Kubrick Regiment, which is fighting for my “imagi-nation”, the Barrayat of Lyndonia. The flags are the usual exquisite GMB Design products, by the way. 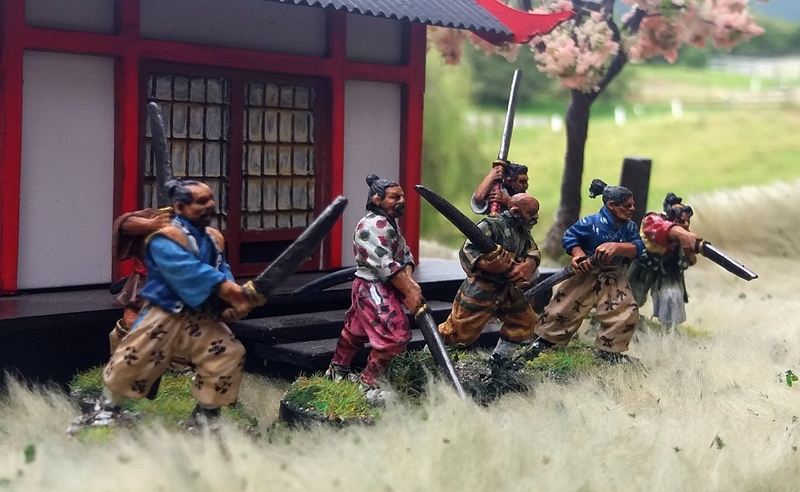 My unit organisation and basing are not designed for any particular set of wargames rules, but are purely the way I like them for aesthetic reasons. Historical accuracy, historical schmaccuracy, for imagi-nation or movie-based armies!! !